One of the Best Selections of Rare Plants Anywhere! This is a condensed version of our regular Blog with reduced number of species and lesser duration of posts. FREQUENTLY/ LOTS OF OUR FAMOUS BLOG ONLY "TEN DAY SPECIALS" BELOW. Jump to older Blog Threads from links below. Brief comments given below. We trim this thread frequently to maintain 30 day run. Specials below apply to drop in visits or mail orders. Photos are representative. All Specials have a termination date. Ten Day Specials expire ten days after date of posting and are marked in red color. Most orders sent in boxes with Fed Exp. No international shipping. To almost anywhere within the continental U.S. Quite affordable. We deliver or we utilize independent trucking services on any size plants. CHECK BACK FREQUENTLY - MORE FEATURED PLANTS ADDED EVERY FEW DAYS. The Staghorn Fern is native to Southeast Asia, Australia and some Pacific Islands. They are an "epiphytic" type of plant. They grow attached to another tree but don't damage or affect that tree. 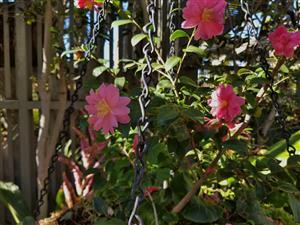 They also can grow on posts, fences or other structures. They like part day sun or strong filtered light. They'd like to be sprayed with water about once a week and are cold hardy into the mid-twenties F. They form green shields at the base of their leaves. And, over multiple decades, form clumps or large balls of many plants together. Most of the plants you'll purchase from nurseries have been grown at that nursery and has seen all the aspects of weather. This may include cold weather, wind, rain or hail, and trauma from being moved around in a nursery. Opposed to this are plants that were grown specifically for interior-scapes. This means plants are instantly ready for bank lobbies, hotels, professional offices and upscale businesses. They are also perfect for interior usage in your home. When one purchases such plants they are often sold with a contract for professional maintenance. We do not do the latter, but we can provide the same top quality interior palms for you home or business. And, we can offer advice on how you can maintain the plants. If you are buying plants for your garden, we don't recommend these imported plants because they are not as tough or sturdy as locally grown plants. Below are some examples of sizes that can be mail ordered or easily delivered. Most are five to seven feet tall. Both larger and smaller sizes may be available. This is the perfect size for most home and business applications. Availability changes over time. These plants are beautiful and without any blemishes, scars on the leaves or unsightly leaflets. 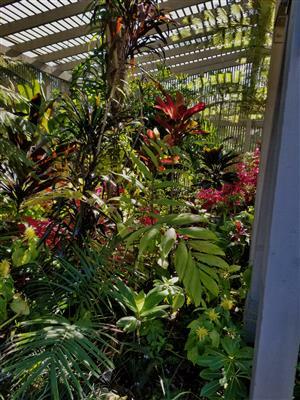 They have been grown in a tropical area, typically Hawaii, and pampered to look beautiful. 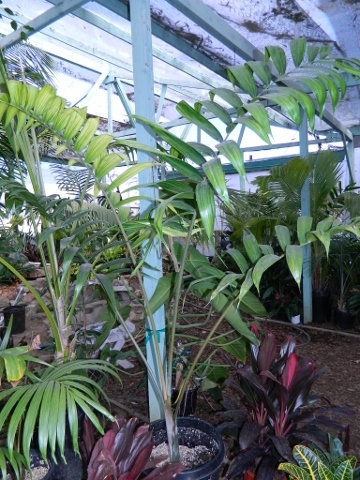 Be aware that interior quality palms are more expensive than regular nursery stock. But, some customers demand this quality. If you see a species you like but don't want interior quality, most likely we offer it as well as part of our regular inventory. As these are imported plants from tropical areas, availability changes over time but most can be special ordered if we don't have them. Just available is a new batch of very nice 15 gallon Ravenea glauca. On smaller Ravenea, R. hildebrandtii is the smallest - a true dwarf. This species Ravenea glauca is not that small, but it isn't super big at maturity. It should max out at about 25 feet. The trunk is narrow. Leaves are green and soft to the touch. In most areas it likes full sun. In the desert, filtered light would be better. Growth rate is medium. Cold hardiness seems to be down to the mid to low 20's F. These 15 gallon plants are very nice. I wish to thank Palmpedia and RPS for photos below. Remember: You must mention this website special for this price when you purchase. Amaryllis are a bulbous plants native to South Africa. They come in an assortment of colors and grow from an underground bulb. They die off in fall to winter but come back each year. They are sometimes called "Naked Ladies" because the first thing that shows in the spring are the blossoms. The leaves come later. They can grow in part or full day sun in many areas. 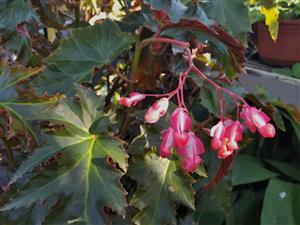 Shown here are a variety with clusters of huge red flowers. They are just coming into blossom right now. 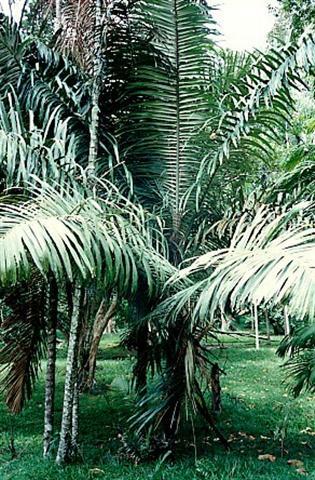 The Queen Palm is quite popular but has one major weakness - it dies at temperatures much below 20 degrees F. This led to the development of the Mule Palm. 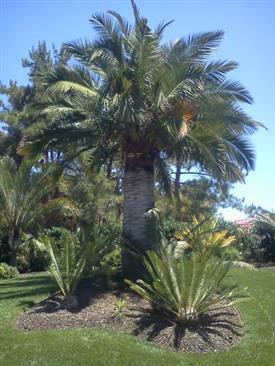 This F1 hybrid is a cross between the Pindo Palm (Butia capitata) and the Queen Palm (Syagrus romanzofiana). The Butia is the seed bearing parent. This hybrid is much more cold hardy and can take temperatures of about 16 degrees F. It gets to a mature height of about 20 to 25 feet. As you know, the Queen Palm gets to 60 feet. This hybrid also takes hot, full desert sun. It is the perfect choice for those that live in a colder, inland area. 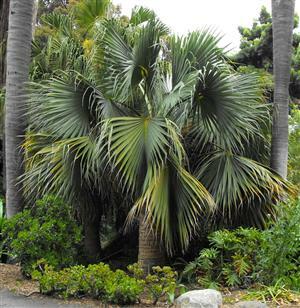 Also, most people think it has a bit of a Coconut Palm appearance and is more attractive than either parent. I'm showing below in the first two rows of photos the 15 gallon on special. Also shown are a 25g and box size plant at the nursery. The garden shot was taken many years ago by M.H. These can be mail ordered although it'd cost a bit to ship them because of the box size. As many of you know, Arengas are usually suckering palms. But, there are several single trunk species. Arenga pinnata is one of these. It is felt to be native to Indonesia and is a large palm. It is a pinnate palm with a fibrous trunk made from woven fibers. Overall height is forty to fifty feet and the trunk gets to a diameter of two feet. The leaves are held upright and can be over twenty feet long. The leaflets, like all Arenga, has jagged terminal ends. This is a monocarpic species and will die when the plant flowers. Other suckering Arenga has new trunks to replace dying flowering trunks. But, since this species has only one trunk, like a Caryota it will be gone a few years after the flowers appear. 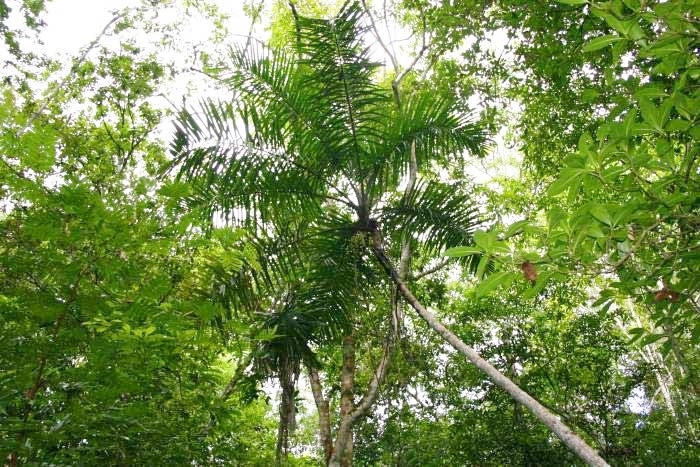 The Sugar Palm is a full sun species with cold tolerance into the mid-twenties F. Shown here is a 15g nursery plant and a photo of a mature specimen. Note that the backs of the leaves are silver. Remember to mention this Special when you buy. 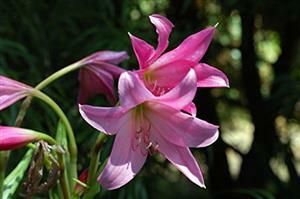 Crinum Lilies are native to Australia. Plants grow from underground tubers or bulbs. There are well over one hundred species and varieties. Leaves are green, long and strap-like. In spring and summer, flower blossoms arise from the base of the plant. 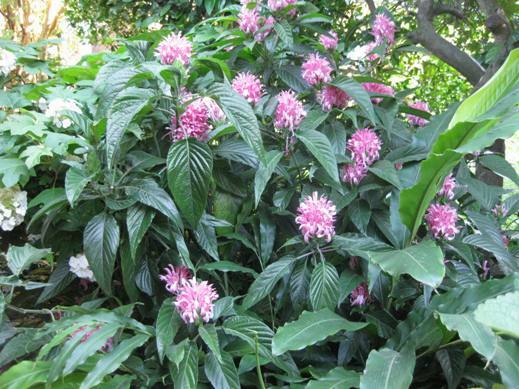 The plants on special have light pink blossoms as shown below. Also shown as well are flowers from a different variety (dark pink blossom by Garthwaite, UK). We do have the Queen Emma Lily which has purple leaves. The plants on special usually have perennially green leaves and blossom in summer. Cold hardiness is into the twenties F.
This typically single trunk tree fern is native to Southeastern Australia and Tasmania. 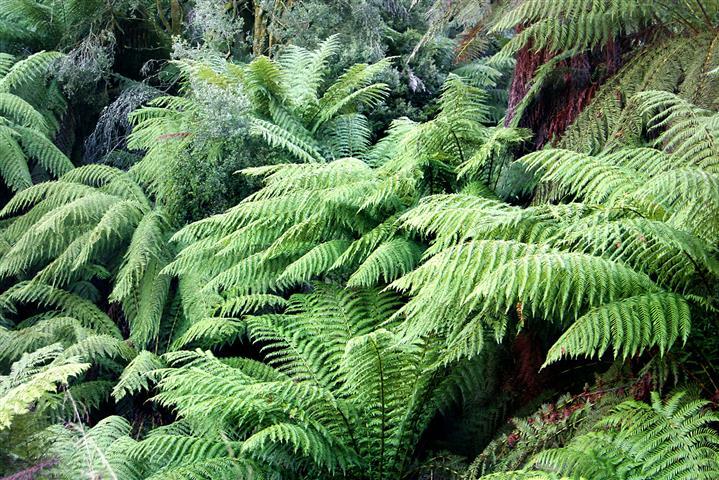 It is much slower growing than the Australian Tree Fern above and has a mature height typically of 8 to 10 feet although they can get even taller. 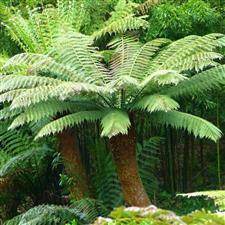 Trunks are a similar diameter to the Australian Tree Fern. Of note, apparently the lower trunk is filled with old, decaying trunk material and new roots grow through this material to get water and nutrition. Cuttings of the top of the trunk can be re-established and root out. This plant likes a bit of sun or filtered light and also loves water. Cold tolerance is 25 degrees F. or lower. The 5g on sale here are very nice as shown. This medium sized fan palm doesn't have a definite home origin. It has large green fan leaves that have a hint of blue. Mature height is about 15 feet. It wants full sun and is cold hardy to about 16 degrees F. Seeds are black when mature and small. Trunks have old leaf bases near the top but fall off over time. Offered today are our 5 gallon size on special. We only have a few. This suckering fan palm in native to Morocco in northern Africa and is often as wide as it is tall. It doesn't get typically as tall as Chamaerops humilus and has a strong blue color when in sun. Typical mature height is usually six to eight feet. It does sucker freely. 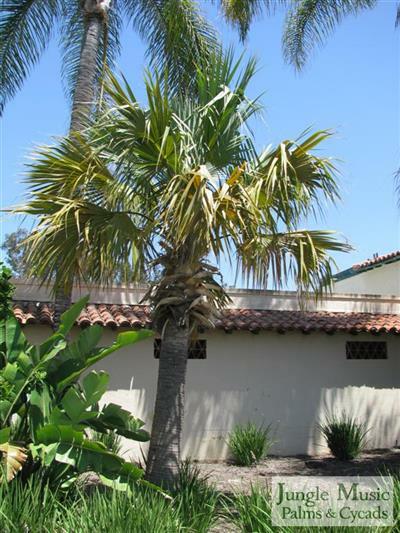 It loves full hot sun and tolerates cold temperatures to about 15 degrees F. So, it's a great palm for folks in super cold areas. It also grows well in the desert. Shown here are the band size that we have put on special. These are a simple mail order item. Be aware these are huge band plants, well rooted. They are not wimpy seedlings. Note they are already going palmate. Of the Shaving Brush Palm family, this is the hardest one to find. And, many think it's the prettiest and most desirable species. Some consider it to be a variety of R. baueri. We like to consider it a species. Native to Raoul Island, an island well off the eastern side of New Zealand, this species has a medium sized trunk and reaches a height of twenty five feet. The crown shaft is gorgeous but not as swollen as R. sapida. I have some customers who report the crown shaft being a purple color. On younger plants, the leaf stems are red colored as shown here. Cold tolerance is the low 20's F. It will take coastal sun or consider morning sun or strong filtered light inland. Just mention this Blog special for this discount. In the second row below I've shown a 5g nursery plant. We also have 15g size. 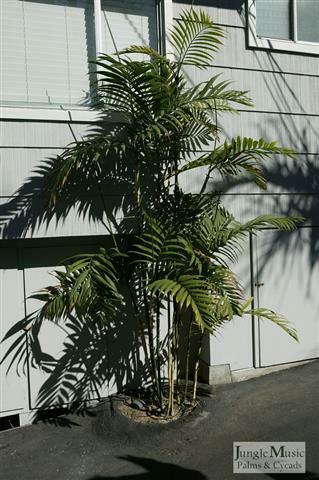 This easy to grow Mexican fan palm hardly ever gets over five feet tall. In the sun, it gets super blue, suckers and doesn't have a large footprint in the garden. Surprisingly, when young, plants are green in color. But, outdoors in the sun, I guarantee that they'll turn blue. Leaves are small compared to other Braheas. It is rare and, unfortunately, very slow growing. I am showing here our 5 gallon plants which are about 5-6 years old. They are quite old for their containers. This species will take sun in all areas and does not like shade. It does well in desert areas. Cold tolerance is about 17 to 18 degrees. We're offering both sizes on a ten day special. And, for this slow growing species, they are oversized in their pots. After a little acclimation, put them right into your garden! Easy to ship. But, you must mention this Blog Only Special when purchasing to get these prices. 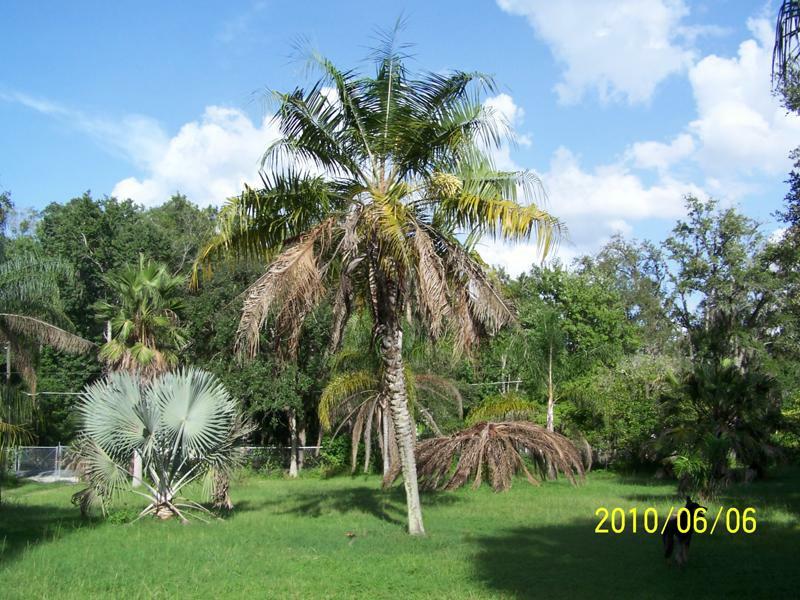 This fan palm species is known for not looking like an arid or more desert appearing species. This is because it's native habitat is in the more tropical southern Japanese islands and Taiwan. It is a lush green palm. It is slow growing and only gets to a height of about 20 feet although habitat plants can reach 40 feet. You'll not see anything like that in most U.S. gardens. Leaves are rather flat and the terminal part of the leaf segments will hang downwards as shown here. Petioles with age lose their spines. To get a ten foot plant in our locality may take 20 years. It can be grown in filtered light or sun. Cold tolerance is about 17 degrees F.
You must mention this Blog special to get this price when purchasing. 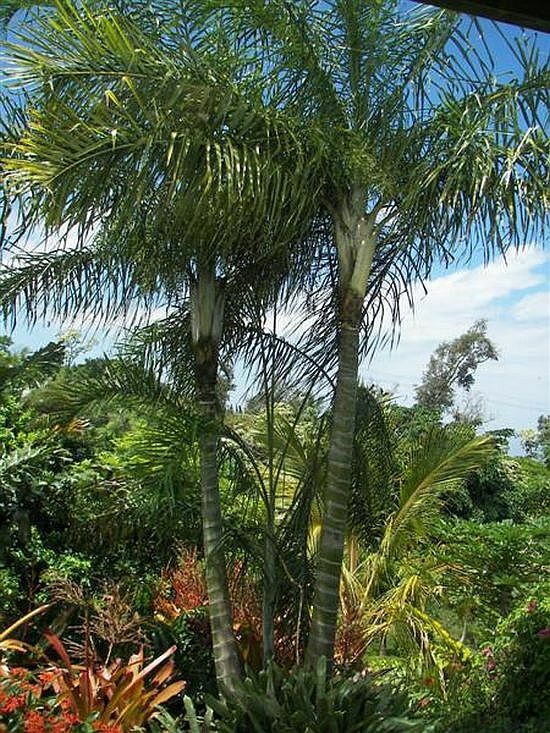 The popular King Palm is also known as the Piccabeen Palm or Bangalow palm. It is native to several areas in Australia. It can in habitat get to sixty feet tall, but in Southern California is usually not over 40 feet tall. It is crown shafted with a gray trunk. The crown shaft is green with some brown speckled areas. Leaf length is 8 to 10 feet. It is not particularly rare. Other species of King Palms are. (we grow them all). Ramenta is present on the back of the leaflets, a hallmark of this species. Cold tolerance is about 25 degrees F. The triples we're putting on sale are triples in the 15g size. Be aware, you can plant a single, double or triple. All do great although the greater the number of plants put in, the slow the growth rate of all. Mention this Blog Only Special at the time of purchase for this discounted price. We do have other sizes for sale. Back in the year 2000, I was the President of the International Palm Society. One of my goals at the time was to break the monotony of Biennial meetings always being held in the United States. I found them to be repetitious and sort of boring. Certainly, no one at the time would have called them exciting meetings. With this in mind, I set up the 1998 Biennial in Thailand at Nong Nook Gardens. That was a first. And, to outdo that meeting, I arranged with the Palm Society of New Caledonia to have to 2000 Biennial in their country. The palms of New Caledonia are some of the most exciting and pretties palms of the world. 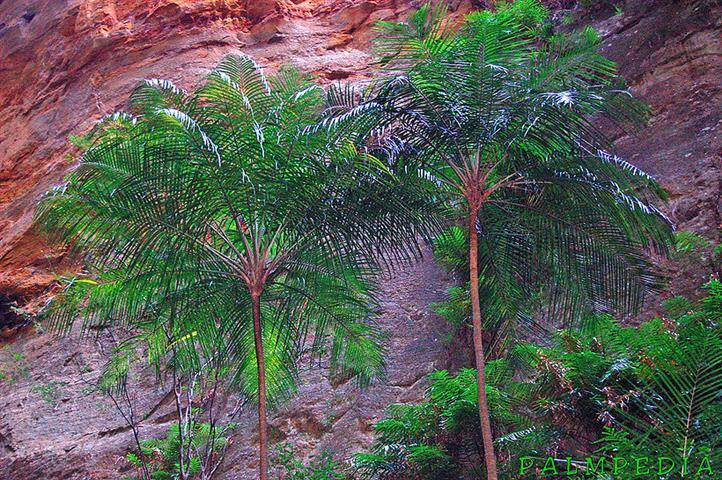 This gave Jesse and I a great opportunity to see the New Caledonian palms in the wild. About 45 minutes out of Noumea (the capitol) is Mount Koghi. This is the home habitat for this species. It has a thin to medium trunk, a white crown shaft and gets to about 25 feet tall. It's very beautiful and does great in Southern California. Most grow it in part day sun. Cold tolerance is into the mid-twenties F. (sort of like a King Palm with tolerance of cold). Shown here are plants that we germinated about 8 years ago. These are very nice 15g plants. You'll not see locally grown plants of this species and size around at all. And, never on sale. We only have a few of these, so don't dally. It's a fabulous addition to any garden. Mention this Special. 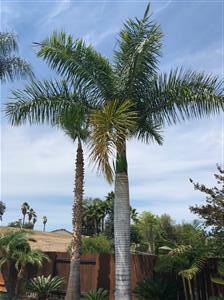 I'm down to the last few of the large 15g that we're offering for sale on this, the Chilean Wine Palm. These plants are approaching ten years old from seed! As most know, they are unbearably slow to grow and getting a nice plant as shown in the first four photos seems to take forever. Try it yourself some day from seed. You'll know why it takes a decade to produce a nice sized Jubaea. Interestingly enough, we ship a lot of this sized Chilean Wine Palms to people in colder states like Texas and South Carolina. This size are not the biggest 15g we offer, but fairly old and very nice. Typical basal trunk diameter is four to six inches on this batch. I do have massive 15g that are 10 inches in diameter, but they cost more. This size is an affordable size for people who want to save a lot of years of growing time. Ultimate height can reach at least forty feet (in several decades) and trunk diameter up to four feet. The leaf stems are unarmed. Seeds are large and globular as shown here. Cold hardiness in into the mid teens F. It's a sun species, even in the desert. But, mention this Special to get your discount. Mail order, in the pot with soil, totally possible. Like many Ptychosperma species, this one is also from Papa New Guinea. It is a medium sized clustering species with trunks that are one inch thick, premorse leaflets (jagged, chopped off at ends) and green leaves. It gets to a height of about fifteen feet. It is quite a rare species and we seldom have this species for sale. Available now are nice one gallon plants that I'm putting on special. This species would be considered a filtered light palm. Cold hardiness is uncertain but I suspect most growers in my locality can succeed with this species. 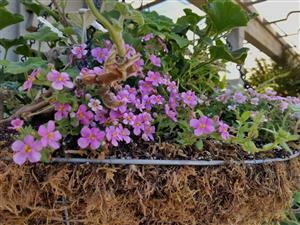 Southern California growers manage well with most Ptychosperma species. These can be easily mail ordered. Remember: Mention this Special for your discount when you purchase. On the Internet there is a bit of discussion about this unusual type of Sabal. It's much smaller than Sabal palmetto (like you'd see in Florida) but bigger than Sabal minor (like you'd see in Texas). Searching shows that plants can develop five or more feet of trunk and they do tolerate full sun in Louisiana. Leaves are medium sized mature and green in color. The last photo shows a specimen that is in filtered light. It's near impossible to find this "species" for sale. I have plants from apparently native seed that I'm offering on special here. These would be easy to mail order. Remember to mention this Blog Only Special at the time of purchase. 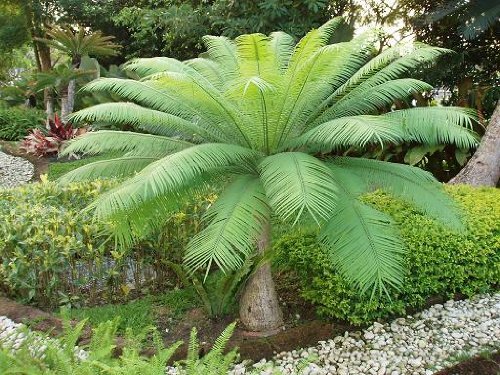 This species of green South African cycad is a medium sized mature plant with trunks up to about five feet. They are un-branched and have green leaves that are about five feet long. The leaves are straight and leaflets point toward the end of the leaf. In the wild stands in the Natal area of RSA, there are only about a hundred plants remaining. Shown here in the first row of photos are 4 to 5 year old band plants - very large for their container. The second row of photos show a huge boxed specimen at our nursery. The last row shows domestic plants and a close up of the leaflets. We're putting older band seedlings on sale. They'd be easy to mail order. In our area, this is a full sun plant with a cold hardiness into the low 20's F.
Remember, mention this Special when you order. We, of course, have other sizes of this species for sale. 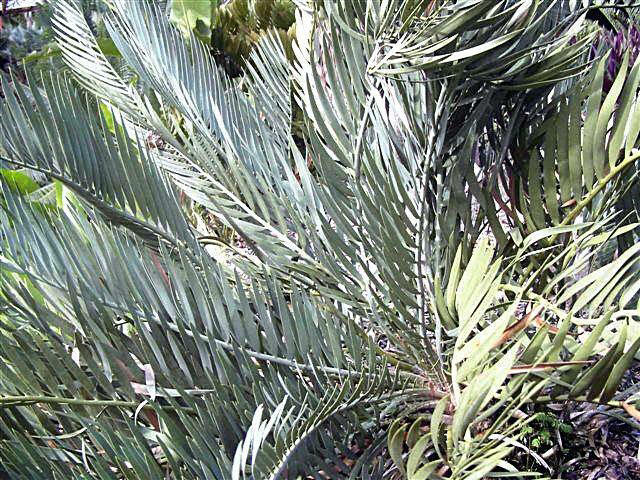 Native to Mozambique, this small to medium sized cycad grows in scrub forest among rocks and boulders. It is distinguished by its blue to blue-green color and by having leaflets that are prominently spiny. In my experience, leaf color is sometimes very blue, other times blue-green. You'll sometimes hear the description as "soapy green" to describe the leaves, but these should be more of the blue leaf type. Overall, the leaf color is variable but I've seen specimens that are as blue as an Encephalartos horridus. Trunk size is usually under three feet. Upright leaves are about four feet long or less. Leaves are keeled and leaflets are lanceolate and spiny. This species likes full sun and is cold tolerant into the low 20's F. The citrus pots size on sale are good, strong plants. They came from parents domestically that both had extreme blue color. These can be mail ordered but not outside the U.S. 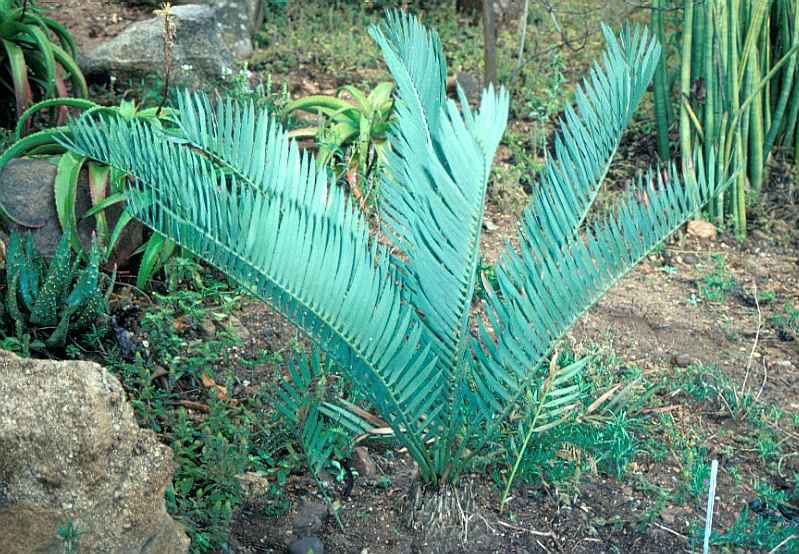 This species very rare blue cycad is endemic to the Limpopo province, South Africa. It can be found at high elevations in the mountains (around one thousand meters), in low deciduous forest and precipitous slopes and cliff (in partial and full sun). The species is almost gone in the wild, populations are small and scattered. It is among the species located in the Transvaal region of South Africa, and is highly sought after. This is a small to medium sized species. Leaf length can range between one to two meters, and stems can reach a height of two and a half to three meters with ancient plants. As the name would suggest, the leaves tend to be a bluish gray, but they can vary in that color from a blue/green color to a powdery white and everything in-between. The leaflets and petioles are mildly armed and can be almost completely unarmed in some cases. In coastal and inland areas, this plant prefers full sun, but can tolerate partial sun. For desert areas, I could recommend partial sun or filtered light. We are offering strong seedlings in band containers at a discount. The last row of pictures show larger nursery plants. Remember to mention this Special at the time of purchase. GET THEM BEFORE THEY GO INTO BOXES! Last year we acquired a few dozen absolutely huge 15 gallon Ceratozamia mexicana. This is the "prototype" of the Ceratozamias. yet still fairly uncommon at nurseries. It is native to tropical mountains in eastern Mexico where it grows in humid or arid areas under forest trees. It is very cold hardy, probably going into the upper teens. It is easy to grow in the SF Bay area. It has green leaves that spread horizontally as shown here. Leaflets are long and come to a point but aren't that sharp. 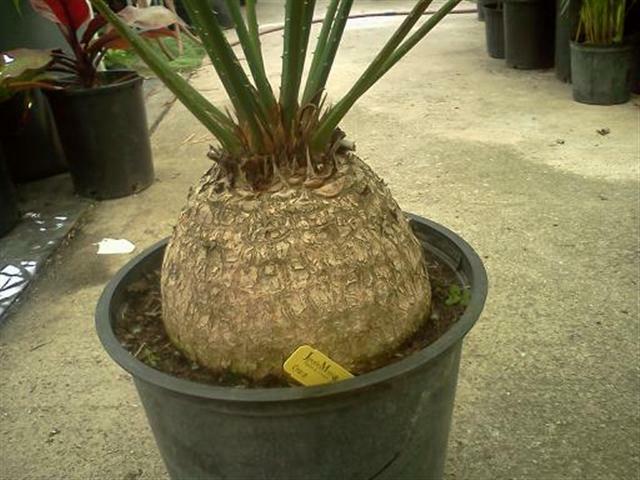 It is slow growing and a fifty year old plant has a caudex that reaches only about 18 inches height. It prefers filtered light. 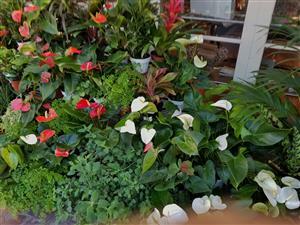 The plants on sale are about twelve years old or more by estimate. They have seen our local cold, being outdoor grown in northern SD County under shade cloth. There are many to choose from. Caudex size ranges from six to eleven inches. Almost all have coned, so we could pick a sexed pair if one requests. All are from the same seed batch. Just mention this special at time of purchase to get your discount. These plants are shippable right to your door. They are instant understory landscape and all are gorgeous. And, they are a bargain at this price and will (within a short time) all go into boxes and be sold at a much higher price. 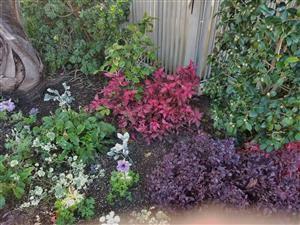 The first two rows of photos are examples of the plants on sale right now. We don't grow a lot of Schefflera. This species is the dwarf variety with smaller mature size and smaller leaflets. 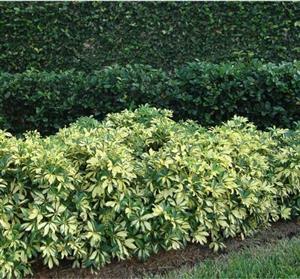 It is also the more sought after variegated form. This species can make a small tree or be used as a shrub with pruning. The plant for sale is wider than it is tall. Perfect would be half day sun along the coast. It's too wide to easily ship. One photo below shows it being used as a privacy hedge. 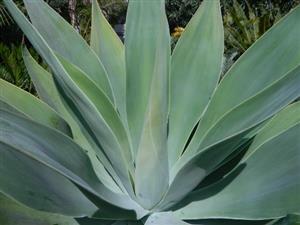 For quite a few years we've been offering this blue variety of Agave attenuata in larger sizes. We are finally down to just several plants and I'm putting them on special. They have formed this narrow, three to four inch diameter trunk with a huge head of stiff blue-green leaves without a sharp point at the end. The tips of the leaves are pliable and safe to the touch. These plants are quite unique and attractive. Obviously, they are quite old. I've found that, if you remove the basal suckers, they seem not to go into blossom. When this species blossoms, that blossoming trunk will die. So, if you get some of these, trim off the suckers. They take full coastal sun but in inland areas prefer part day sun. Mention this Blog Only Special for this price. I can mail order these but, because of size and weight, it'd be pricey. This species has been known for decades as Zamia picta but in more recent times is being called Zamia variegata. It gets its name from the fact that the leaflets contain yellow or gold colored streaks, blotches or spots on them. It is a small cycad with stems under on foot in size. Leaves are typically three to five feet long. The leaflets are green. The spots are variable in their intensity, but light colored and a yellow hue. On some plants these markings are more prominent than others. It is native to Mexico and Central America. It prefers filtered light and should be protected from a freeze. The last photo is by friend Rolf Kyburz. 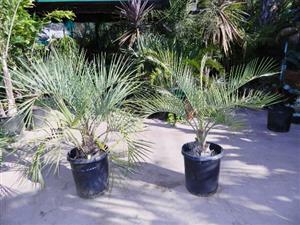 Be aware this is a rare cycad and difficult to find for sale. Remember: Mention this Blog Only Special at the time of purchase. This bamboo is one of the "clumping" types as opposed to one that has a tendency to run and spread. It is known for its yellow trunks with vertical green stripes of varying width and form. Mature height in the ground is 20 to 25 feet. In a pot they do quite well and get up to 15 feet. This is a good botanical privacy blocking species. It can also be grown indoors. Cold tolerance is apparently into the upper teens F. It likes sun and water. Shown here is our 15g size. 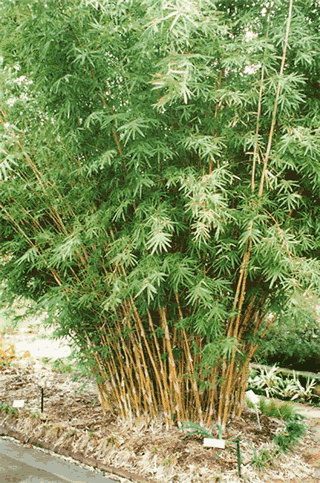 We only grow a few varieties of Bamboo but think this is a nice one - if you like Bamboo. We also have nice 5 gallon available and would give a discount on them as well. Remember to mention this Blog Special to get this price. Earlier this month I showed you 7g and 15g Jacobinia carnea. A few days ago I got in nice 1 gallon in blossom and am putting them on sale below. This exotic filtered light dwarf plant puts out clusters of huge flowers. This variety is pink but they also can come in red, apricot, orange, yellow and a whole assortment of other colors. They typically get to a height of five feet or less and throw long lasting blossoms. See how beautiful they are in summer when blooming. Along the coast they can take full sun. Cold hardiness is into the twenties F. Plants are about as wide as they are tall and make a wonderful and colorful addition to the garden floor. You'll not see this plant around too much. Just remember to mention this Blog Only Special at the time of purchase to get the discount. The garden photo below is from igarden website. Also, be aware that soon we'll no longer be able to get these. They are a summer bloomer. 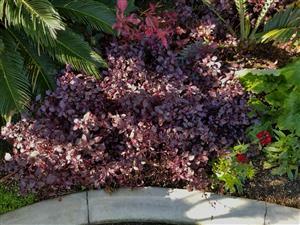 This smaller, drought tolerant hybrid succulent is unique in that it has gray-green leaves with reddish ruffled ends on the leaves as shown here. Overall height mature is about a foot. They take full sun along the coast but can be somewhat frost sensitive. They blossom in late summer with red flowers. Also, provide good draining soil. 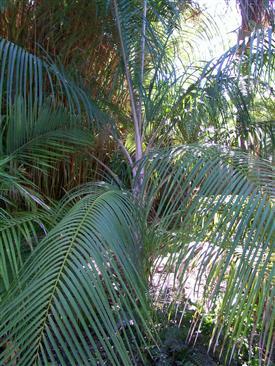 This semi-dwarf fan palm is a suckering palm native to the SE portion of the United States. Typical heights are about six to seven feet although there are plants to ten feet. Leaf color is more commonly green. 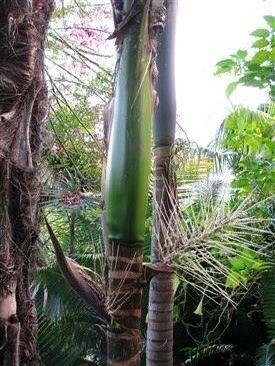 However, there are sought after blue clones of the suckering palm. Leaves are small, typically two to three feet across. Leaf stems are armed. It is a full sun palm with a cold tolerance into the upper teens F.
Just mention this Special for your discount when you purchase. It's not that uncommon that I'll talk about various types of Bamboo Palms. Three decades ago this species (Chamaedorea hooperiana) would have probably been called a variety of Chamaedorea costaricana. 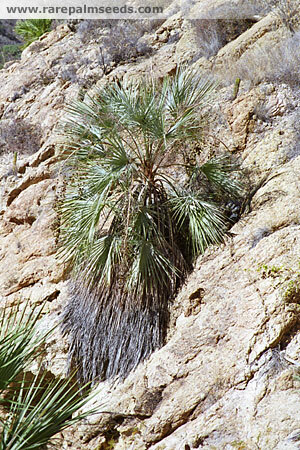 But, in his book on Chamaedorea, Don Hodel described this species named after friend and palm enthusiast Louis Hooper. So, it now enjoys its own status as a species. And, it deserved species status because it is quite different than Chamaedorea costaricana. This species is native to high elevation rain forest in the Veracruz area of Mexico. It grows at up to 5000 feet elevation in habitat. It reaches an overall height of twelve to fourteen feet. It is also quite wide at maturity with many canes. These canes will sometimes lean outwards, making the clump wider. Trunks are about one inch thick. Compared to Chamaedorea costaricana, this species is more full and wide. It's hard to "see through" this species whereas you'd have a better chance of seeing through a costaricana. Also, the leaves of costaricana are shorter. Hooperiana leaves are four feet long or more. Shown here is a 15 gallon sized plant that is about ten feet tall. This species likes good draining soil, adequate water, filtered light and is cold hardy to the low 20's F. I'm showing in the last photo a 25g plant which is no longer in stock. But, the 15g size are very established, full and about ten years old. Mention this Special to get your discount. BTW, these are not easy to find on the market. 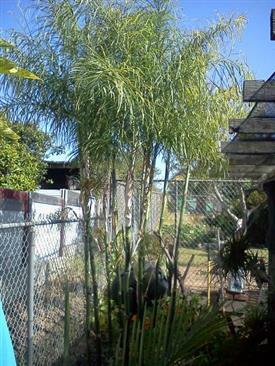 Brahea clara is a blue fan palm from Baja California. It is most closely related to Brahea armata but there are many distinct differences between the two. Brahea clara has longer leaf stems. It is quicker growing. And, the armor on the stems is very peculiar and irregular. It is typically blue in color and loves full sun and heat. Many argue that Brahea clara is, at best, a variety of B. armata. Others say it's a separate species. Another difference is that Brahea clara petioles are more of a green color compared to the blue of armata. Also note how the Brahea clara leaf stems are fairly clean and smooth. There are none of the dorsal petiole hairs you see on the Brahea armata. Rather, clara are smooth and shiny. We have several 5g plants available - not a lot. At this point they don't show the blue color very well. You can see from the habitat photo c/o RPS that they are blue color in the wild. But, many of the plants I've seen are blue green as shown in the first garden photo below. I'm also showing you some 15g plants we had a ways back. Remember: Mention this Blog Special when you purchase. 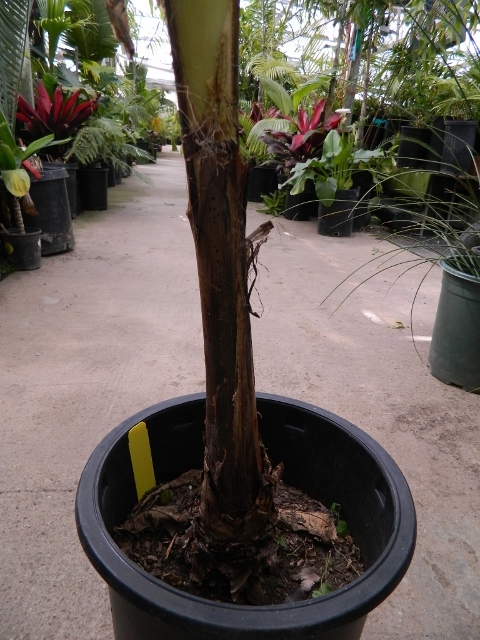 Euterpe edulis is a fun palm to grow because it is super attractive, has a narrow trunk and a beautiful, smooth crown shaft. I have had several in my garden. On mine, the crown shafts were a purple-green color but it's more common to see them as a lime green. Maximum height is about thirty feet with about a four inch thick trunk. Leaves tend to arch down and leaf color is green. This species likes to start in filtered light and work it's way into full sun along the coast. It's cold hardy into the upper teens F. Anticipate a plant life of about thirty years. 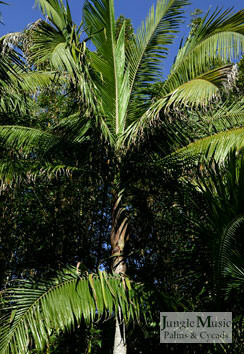 Also of note is the fact that the hearts of this palm are edible and a delicacy in many areas. Limited numbers available. Remember to mention this Blog Special when purchasing to get this price. The first specimen photo is c/o Wikipedia. 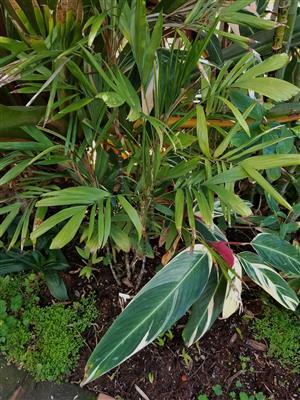 This is a suckering dwarf to semi-dwarf simple leaf palm that is native to Mexico. It suckers, rarely gets over six feet tall, has short petioles and has small, entire leaves as shown here. The leaf surface is a bit wavy and sometimes a bit of a mottled green color. And, the new stems emerging do so in a totally different fashion. It is called "stolinifera" because it forms new "stolons". These are vegetative stems that emerge from the base of an older trunk. They then shoot laterally, sometimes below the soil's surface, to reappear a short distance from the mother stem. They look like "snakes" going over the soil surface, sometimes diving into the dirt to root. Often they'll wildly shoot out of the pot, then turn upwards to form a new vertical stem. This ability to shoot out new stolons often creates a very wide mature clump. Stems are a quarter inch thick. This is a filtered light species with a cold hardiness into the low 20's F. This species is native to mountainous areas in Mexico at about 2500 feet. It's a great garden species. People are easily growing it in San Francisco and cooler areas. We usually propagate vegetatively as hardly ever are seeds available. We have very limited numbers of five gallon plants I'm putting on special. This size is shown in the first two rows of pictures below. I highly recommend this species. Remember: mention this Special for your discount at the time of purchase. 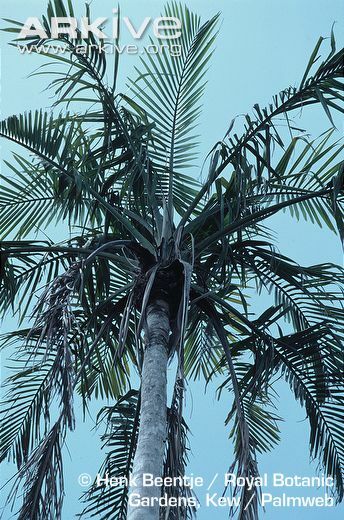 This exotic suckering pinnate palm is native to Sumatra, Java and Sulawesi. It has thin trunks that can have a blonde color. Leaves are somewhat narrow, green in color with an unarmed petiole. Mature height in CA is usually about twelve feet although in the tropics they get much taller. They like filtered light but can take a bit of morning sun. Too much sun here will burn them. Cold hardiness is into the upper 20's F. I had a mature specimen that produced large numbers of purple fruit for years. This species is similar to Pinanga kuhlii but has more repetitive regular leaves and less mottling to the leaflets. Of note, some taxonomists consider these two species synonymous. Shown here are some of the few 5g plants we're offering for sale. These are shown in the first six photos. Also shown is a 25g plant. We have or can obtain these if needed. The 5g plants are in limited numbers. Most enthusiasts would love adding this species to their garden. Remember: Mention this Blog only special at the time of purchase. This size can be mail ordered. This This suckering palm species from the Comoro Islands near Madagascar is ideal for filtered light. It produces stems about three inches in diameter and typically gets to a height of about fifteen feet in many years. It usually does sucker but, in my experience, has a limited number of trunks. Sometimes plants remain single trunk. The crown shaft areas of large plants often shown an assortment of colors including silver, brown and green. Leaflets are wide and leaves are a bit keeled. It has prominent rings on the trunk. Shown here our band size on special as well as a 20g plant. Figure cold tolerance is into the mid to upper 20's F. These plants would be simple to mail order. Mention this Blog Special for you discount when you purchase. This species of thick trunked fan palm is native to Dominican Republic and Haiti. It can get to over 60 feet tall with a massive 2 foot thick brown trunk. Leaves are larger than the similar but smaller Sabal palmetto. Growth rate is quick. It is also very cold hard and likes full hot sun. It can go down to the mid-teens F. The band size shown below are between three and four years old. This is the only size we currently have available. Just remember to mention this Blog Special when ordering to get your discount. My thanks to Wikipedia and Justen Dobbbs for the more mature plant photos below. For those of you who like small cycads, this one should be one of your favorites. Native to the Eastern Cape region of South Africa, this species has largely a subterranean stem with an above the soil caudex rarely over six to eight inches in diameter. Leaves are up to three feet long, often plumose. This is a full sun species with a cold tolerance down to about 22 degrees F. These are a difficult cycad to find. They are slow growing. The Citrus po1.5 gallon plants here are 3 to 4 years old. I have very limited numbers for sale. Just mention this Blog Only Special to get this price when you purchase. These would be simple to mail order. 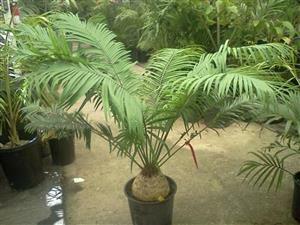 This rare dwarf species of South African cycad is quite petite and never gets over four feet tall. 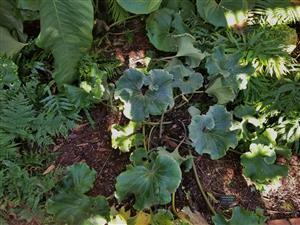 Leaves are gray-green to sea foam green and about three feet long. A mature caudex is six to eight inches. 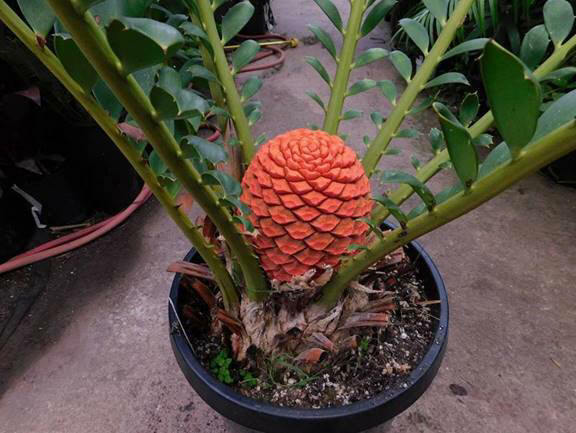 Below I'm showing a totally in cone mature nursery specimen with a 7 to 8 inch caudex (female) likes sun and is cold hardy to the low 20's F. This is a rare and sought out species and never inexpensive. WE do have an assortment of sizes available. Just remember to mention this Blog Special for your discount when you purchase. 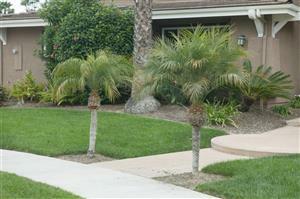 A collector in Vista, CA that has an interesting and different Dypsis in his yard that has set seeds. 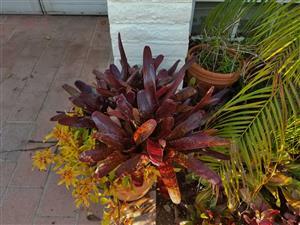 The plants being offered are from this plant and 1.5 gallon size and are about 3 years old. There are some photos of the mother plant below. He says it doesn't sucker but "split" above the ground. So, in the photo, you see two trunks. The interesting thing about this plant is the trunk. It is medium sized, about six or seven inches thick. But, there is a "step off" at each growth ring. One normally doesn't see this with Dypsis. Leaves are very keeled, about six feet long. Leaflets almost touch each other side to side. Overall height is twenty feet. Flowers are red. This unknown species is tolerating full sun here and takes temperatures into the mid to upper twenties F. They should tolerate full coastal sun. I am unaware of anyone else selling this "species". Remember: You must mention this Blog Only Special for this price. 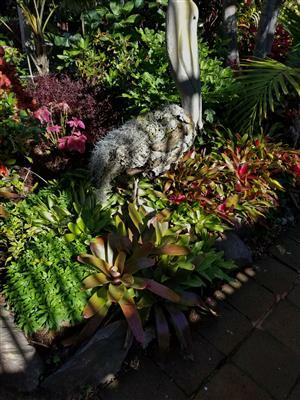 In January I visited Sherman Botanical Garden in Corona Del Mar, CA. This is a small coastal community near Laguna Beach. 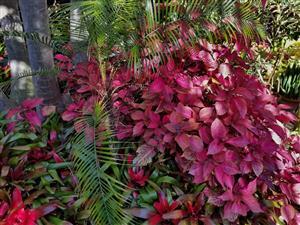 What I really enjoy about this garden is their usage of colorful and tropical companion plants. The garden is meticulously maintained and very attractive. I thought I'd show some photos of colorful plants. 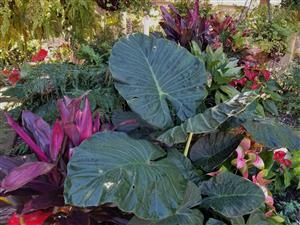 Included are Bromeliads, Anthurium, Begonias, Camelia, Ligularia, Cyclamen, Violets Alocasia and many other types of plants. All were being grown outdoors, some in sun and others in filtered light. This attractive cycad is from northern Thailand near the border with Laos. There is found on steep limestone cliffs where very old specimens can get up to fifteen or twenty feet. Leaves are short at four to five feet. Caudex are not fat and often swollen at the bases - somewhat of a "water bottle shape". Their caudex texture is rather smooth appearing. Leaflets are un-armed and green in color. Trunks are a light tan. Growth rate is average. In habitat, this species sees cold weather and often tolerates snow. For this reason, growers here have found it to be a very cold hardy cycad, taking cold temperatures into the mid to low twenties F. Although it was first named Cycas petraea, most accept the new name of Cycas loei that comes from its locality. I'd recommend growing it in part day sun or filtered light. Shown below are plants of this species that we have or have had at the nursery. They are hard to find. The last photo is from Amazon.de Website. DO YOU LIKE UNUSUAL CHAMAEDOREA? The plants I've put on special here should turn out to be something quite different and perhaps fantastic. 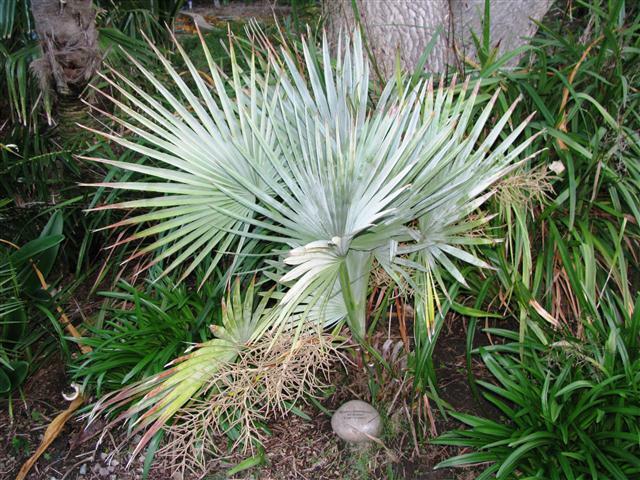 When someone hybridizes a palm, he tries to pick parentage that will give something special - preferably different and a plant not known to cultivation. Chamaedorea costaricana is probably the best of the Bamboo Palms. It suckers, gets to about 16 feet and is very attractive. It's easy to grow. If it had a weakness, it would be that the canes are only about an inch thick. 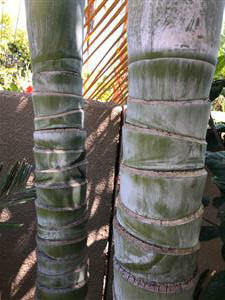 Then, consider crossing it with a shade palm with a much thicker trunk, longer leaves and wider leaflets. This leads you to C. woodsoniana, known for its beauty, thick trunk, long leaves with wide leaflets and exotic appearance. 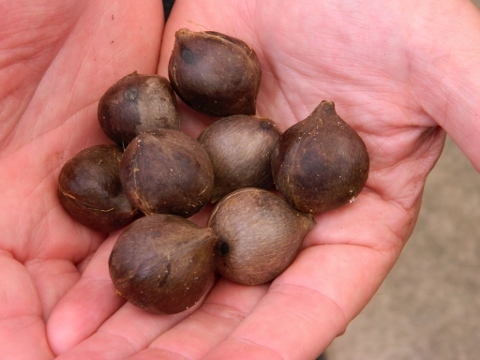 The plants shown below are a cross between C. costaricana and woodsoniana with the woodsoniana being the seed bearer. Our hopes are that these will be a suckering thick stem plant. But, we've not seen evidence of it yet. I only have a handful of these and all are good sized in 7 gallon pots as shown. I can't show a mature cross because I don't know if it's ever been done before. You must mention this special to get this price. I only have three available. It'll be a filtered light palm with a cold hardiness probably in the mid-twenties F.
About twenty-five years ago when my son, Jesse, and I visited Queensland, Australia, we made it a point to seek out and see Licuala ramsayi. This was because this species has been proven to grow in coastal areas of Southern California. The last photo below is from that trip. We just got in some nice, somewhat older one gallon plants with five to six leaves. Within a few more leaves they’ll be showing the classical look with wider leaflets and a near full circle to the leaf. Mature plants are about fifteen to perhaps twenty feet tall with huge overhead and circular leaves. These leaves are divided but the overall appearance is almost a full circle of closely spaced leaflets. Trunks are narrow, about four to six inches. Petioles are mildly armed. Surprisingly this species likes a bit of sun along the coast. 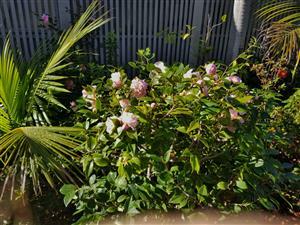 In shade, its growth rate stalls. Cold hardiness is right about at a freeze. Shown here in the first six photos are the size plants we have on Special. The next to last photo is in the San Diego area and is getting a fair amount of coastal sun. Just remember to mention this Special to get your discount. 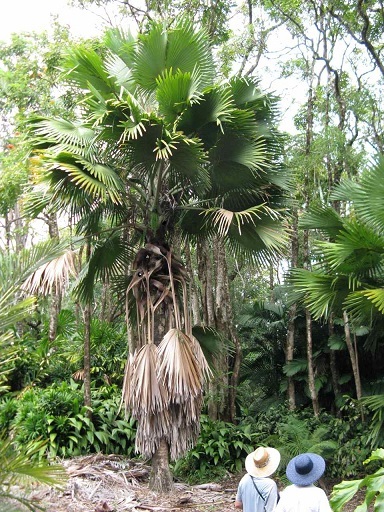 The popular Kentia Palm is native to Lord Howe Island. There it lives at lower elevations. At higher elevations up the mountains one sees Howea belmoreana and Hedyscepe. The Kentia does great here in So California. It is a single trunk species that is often grown as a "multiple" with several plants in the same pot. It does NOT sucker. Along the coast it takes full sun or part day sun. Far inland, filtered light is needed. Cold tolerance is about 25 degrees F. Mature height in sun is usually about thirty feet in 30 years. Plants can be easily shipped for folks who are looking for an interior plant or one for the patio/garden. I'm showing you here both single plant and multiple plants in 5 gallon size. (first 5 photos below) We have limited numbers of both. Also shown are larger sizes at the nursery and two garden specimens. The native home of Archontophoenix purpurea is the Mt. Lewis mountain range in Queensland, Australia. This species is known for the purple color to the crown shaft. It is found at an elevation up to 4000 feet. Mature height is quoted to be over fifty feet, but in habitat and culture I didn't see one this tall. 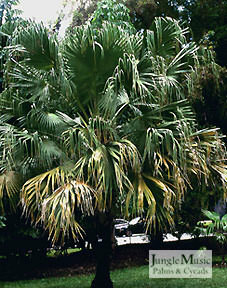 For types of King Palms, this species is stated to have the thickest trunk. I don't think I agree with this and feel A. maxima is thicker. Most I've seen have a trunk diameter of twelve inches or somewhat more. Cold hardiness is about 25 degrees F. It takes full coastal sun. The degree of purple in the crown shaft is variable but never "lollipop" purple. The underside of the leaves is silver and there is ramenta hairs only on this side. 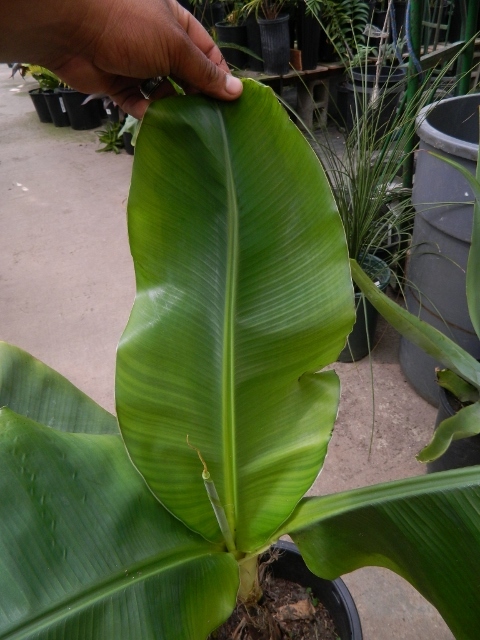 On younger plants the leaf bases and leaf stem tend to have a yellow color. I'm showing our 15g size which we're putting on a Ten Day Special. This size is shown in the first two rows of photos. You'll note that the crown shaft is beginning to pick up the purple color. We also have other sizes of this species for sale. Remember to mention this Blog Only Special when you purchase to get this discount. Prestoea is a genus that is very closely related to another palm genus, Euterpe. It is found in the Caribbean, Central and South America. Essentially all Euterpe are crown shafted palms. Many of the Prestoea are not. There are also distinctions between the flowers of these two genera. Also, many of the Prestoea are suckering. But, there is one that is single trunk. This is Prestoea montana, native to mountainous areas of Puerto Rico. I've always known of this species as not having a crown shaft. But, I've seen photos (including ones from native habitats) where a crown shaft is seen. The hallmarks of this species are its wide and very shiny green leaves, its somewhat slender trunk and its overall beautiful appearance. Plant heights can reach forty feet or more. This species should be grown in part day sun or filtered light. It likes rich soil and ample moisture. I'd estimate its cold tolerance is down to about a freeze or a bit less. It is not a beginner species. Shown here are some 5g plants that we just got in. Previously, we've only had a few 15g plants. We're putting the 5g plants on special. Note that this species has historically been known as "Prestoea montana" but in more recent years has been considered a variety of P. acuminata. Remember: Mention this Special for this price! The seeds of this "species" first came out about twenty-five years ago. At that time, we did grow it and I think we’re one of the first to offer it for sale in the U.S. From seeds, some of these plants end up being single trunk, others suckering as shown below. 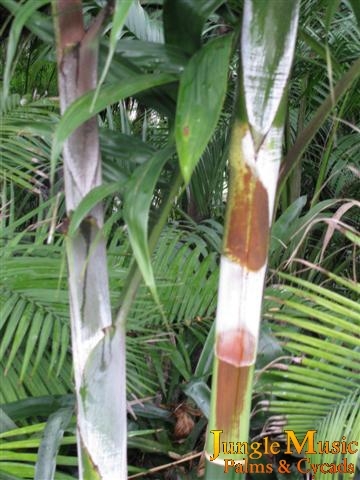 It is very closely related to Dypsis madagascarenensis. The mahajanga is sometimes single trunk and other times will sucker. Trunks are medium sized diameter, prominently ringed and leaves are plumose. Anticipate a mature plant height of about 20 to 25 feet. Culturally, it would like to be in or work its way into coastal sun. Cold hardiness is the upper twenties F. or a bit colder, Some have reported that this species seems to be more cold hardy than D. madagascarensis. Shown below are the 5g plants we’re putting on special. The first garden photo showing the trunks with my son, Jesse, and Greg Hamann was taken in El Cajon, Ca. The next photo is from Al Bredison in HI. For many decades, Al lived here in CA. Remember: Mention this Special for your discount! TEN DAY SPECIAL THIS SIZE. 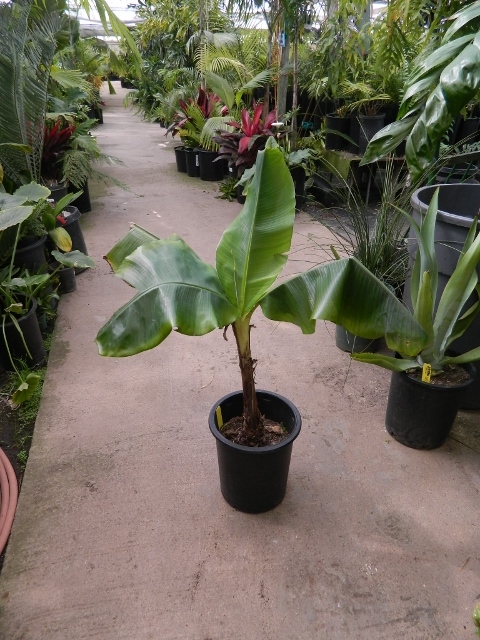 We only sporadically can offer this very affordable size of our four to five foot size of Dypsis lutescens. But, I am pleased to announce that we just got in a limited number of 3 gallon that this size. 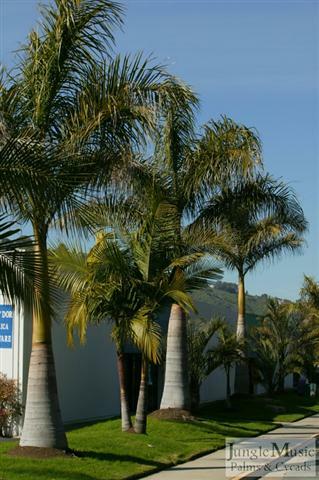 This is a suckering palm species from Madagascar that is medium sized mature, seldom over 18 feet in Southern California. It has attractive, thin trunks with a prominent yellow color on the petioles and inner crown of stems. It has a medium growth rate. Along the coast, it prefers sun or very bright filtered light. In inland areas it cannot take full sun. Cold tolerance is into the mid-twenties F. We also have larger sizes available (see below). 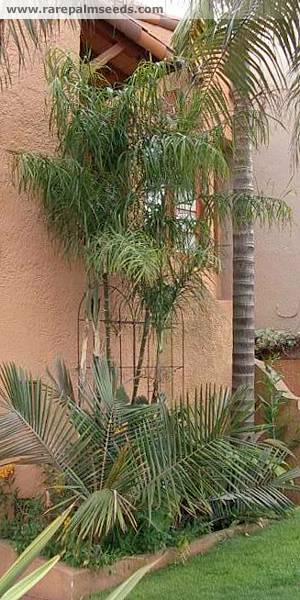 We remind people that this palm is the most popular palm for blocking the neighbor from looking over the fence into your yard! For this reason we also call it the "Neighbor Blocking Palm". We only have about a dozen of this size. And, these are very difficult to find for sale. You must mention this Blog Only Special at the time of ordering to get this discounted price. This species is native to various regions of South Africa. It prefers filtered light but can tolerate some sun. Leaves are thick and green in color. In sun they are more of a lime green and shorter. 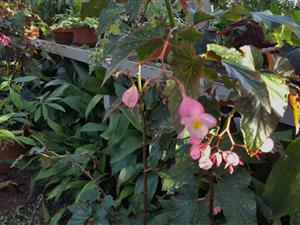 Interesting blossoms emerge faithfully and are shown in a nursery plant below. Surprisingly, these are a bit difficult to find. They do tolerate cold into the mid-twenties or lower and are being grown in the SF Bay area with ease. The first four photos show the size on sale. Mail order possible. Mention this Special for this Blog Only Discounted price. What good fortune is it that New Caledonia can claim to be the home of all Chambeyronia. Included is this species, C. macrocarpa. 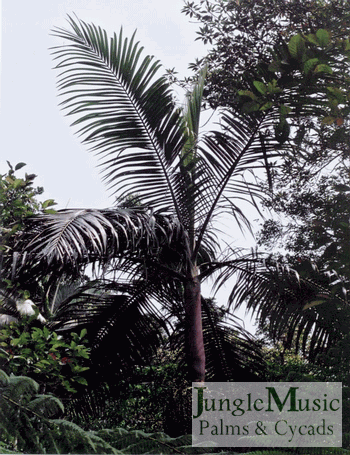 It is a slow growing, pinnate, crown shafted palm that gets to a height of about 30 feet. It has a dark green to green-black crown shaft. Compare this to C. hookeri above with it's yellow crown shaft. Leaves are wide, thick and leathery to the touch. With good culture, maybe you can get three new leaves a year. About one in twenty plants fail to throw a new red leaf - rather, it remains green. This is just bad luck and there's no way to predict which will do this. Shown here are 1 gallon plants we're putting on sale. We do have larger and smaller sizes available. Coastal sun is tolerated although strong filtered light is ok for most areas. This is a great garden palm. Just mention this special when you buy. I thank TS at RPS for usage of his photo below. Most people are familiar with this species, the Pygmy Date Palm. It is naturally a single trunks species. But, they are usually sold as "triples" - three individual plants in the same pot - so often, that people think it's a suckering species. And, 99% of plants are sold as a "multiples". This species is a type of Date Palm, so it does have spines on it's stems. Mature height is about ten to fifteen feet. 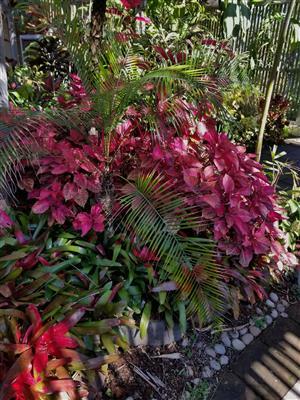 It likes full sun and is cold hardy to about 22 degrees F. Over the years, many people have found that imported plants from Florida or Hawaii perform poorly over the years with taller stems failing and falling over. The plants shown here are locally grown, multiples and should prove to be very strong plants. These are easy to mail order. 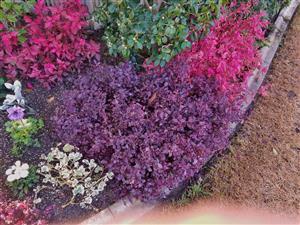 The last photo shows garden plants that are single so you can easily see the plant. SUPER RARE - SPECTACULAR BLOSSOMS! 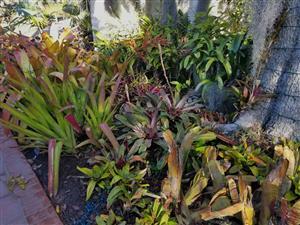 A year ago we acquired a portion of a large and unique Bromeliad collection that came from the late John Arden. Although I did not know him personally, he was a famous bromeliad hybridizer and collector. He had an extensive collection of plants and we were fortunate enough to obtain a portion of his collection. The plants we obtained were solely Vriesea and Vriesea hybrids, some quite unique and rare. Vriesea are known for unique and interesting leaves and spectacular blossoms. I am working on a complete presentation of these plants but thought I'd give a preview presently. The spectacular thing about Vriesia are their blossoms. They tend to be bright colors and are large, sometimes branched. I'm showing three below that are going into blossom right now. We have many others for sale. To read more about this collection, click on the link below. For anyone who's looked for this species lately, you realize it's in very short supply and essentially unavailable in larger sizes. This is because of a several year shortage of seeds. We are pleased to presently put nice 5 gallon on special and they are very nicely sized. All are multiples with at least 3 plants per pot. This species gets up to about 14 feet height with a green, ringed trunk about 1.5 inches in diameter. The leaves are plumose or fluffy. 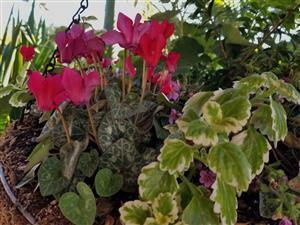 They are quick growing and perfect for narrow planter areas. It will take full coastal sun. 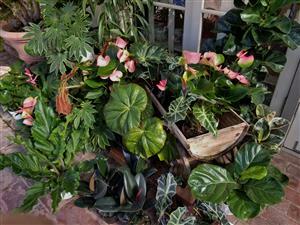 Cold hardiness is into the mid-twenties F. It can also be used as a houseplant in a bright area. These plants in this size pot are too big to ship by traditional carriers. But, we can arrange delivery. And, we also have 5g. I'm also showing 15g plants we have for sale. Mention this Blog Special for your discount at the time of purchase. NOTE: The first five photos are our 5 gallon size. Also shown is our 15g size. One photos is by TS at RPS. This is a super popular variety of ginger that blossoms in the summer. Blossoms are white with yellow and red throats. Mature height of these plants is six to seven feet. 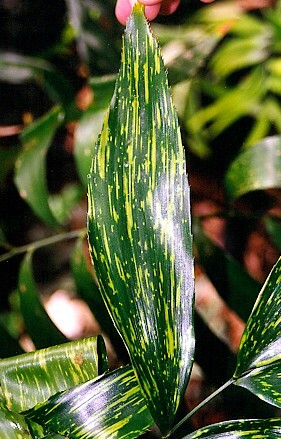 The leaves are prominently variegated with lighter green and yellow. Blossoms are long lived but not fragrant. Blossoms occur during the summer. I think they do best in part day sun although right on the coast folks grow them in full sun. Cold tolerance is one of the better for ginger, probably the mid-twenties F. The last photo shows our 15g size of the green form of this species which is not on sale right now. Just mention this Blog Special to get your discount. Below I'm showing you an assortment of photographs of cycads at our nursery. I've tried to make this a collage of species to show you the numbers and diversity of the plants we have for sale. 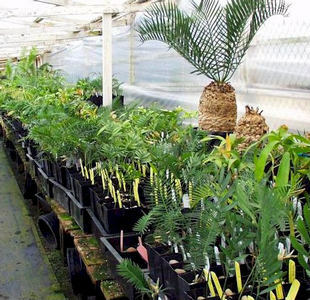 We have over 10,000 cycads in inventory of about 150 species or varieties. This includes new seedlings, intermediate sizes and many mature specimens, some with trunk overhead. 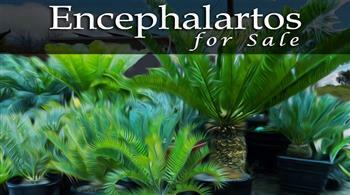 Inventory includes Encephalartos, Dioons, Ceratozamias, Zamias, Lepidozamias, Stangeria, Macrozamia, Cycas and more. We feel that we have the largest offering of rare cycads anywhere in the United States. We can ship or deliver any of these plants within the US. Also, we can offer advice on species best for you and give cultural advice on growing. This post is not meant to educate you about Encephalartos. Rather, it's merely a presentation of some of the smaller sizes of this genus that we have available at the nursery. Some customers like to buy small cycads. So, we went around the nursery pulling one gallon and band plants. 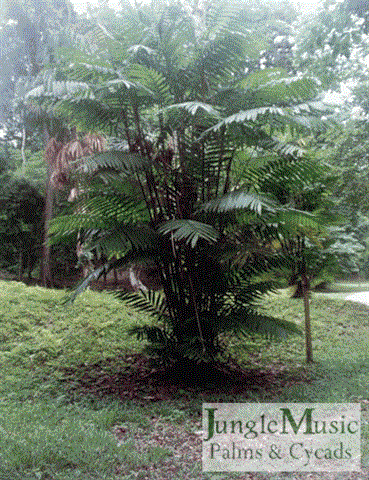 All below are Encephalartos except for the first photo, Stangeria eriopus. I'm showing about three dozen species You'll note some are quite old for their container. A few are probably over five years old. Only one or two are new seedlings. I hope this gives you an idea of our Encephalartos inventory in small sizes. All of these would be easy to ship within the U.S. And, our two most popular small sizes will be on sale for ten days. Of note, availability does change over time. If we don't have what you seek, we probably have a great substitute (or large plant) or will get in your chosen species in a while. What a great way to start a collection all at once. Just remember to mention this Special at the time of purchase. This attractive green cycad is native to Mexico and perhaps parts of Central America. In centuries it can get up to 20 feet tall. Trunks are thin, leaves are minimally armed, can be used on a patio or perhaps in the house and tolerates filtered or part day sun. It wants filtered light along the coast or a bit of sun. Cold tolerance is the mid, perhaps low 20's F. The 5g on sale have about 4 to 5 inch caudexes and are 7 years old. They can be shipped. Remember: Mention this Special at the time of purchase. 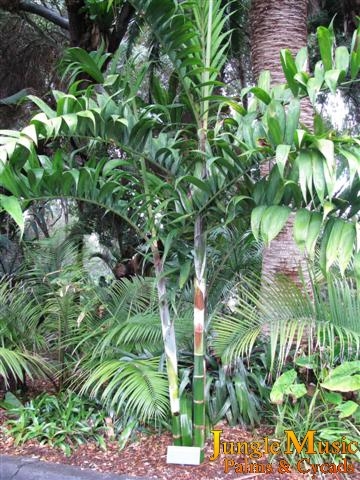 Shown here is a 5 gallon plant of a Brahea species from Mexico that is presently known as "Brahea species Super Silver". Undoubtedly someone will describe it in the near future. Seeds have been available only twice. These plants are from the first batch that came along. It is a blue plant but doesn't show the blue until older. It wants full hot sun and would be perfect for the desert. I suspect the cold tolerance is similar to Brahea armata, about 15 degrees F. But, compared to the later, this species trunk is much thinner and it is faster growing. But, the blue color is just as intense. Shown here is the 5g size. Limited numbers. Mature plant photo below c/o RPS. Remember: Mention this Special at the time of purchase for this price. This pinnate New World species is another favorite of mine. When I started with palms about forty years ago, enthusiasts frowned when I mentioned this species and said "unfortunately, Phil, you can't grow the Royal Palm here". Well, I didn't buy that and instead had optimism over it's possibly doing well here. And, exactly the latter has proven to be the case. 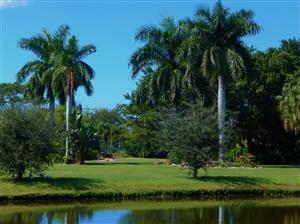 If you can grow a King Palm, there's a good chance you can grow a Royal Palm. There are multiple species of Roystonea. 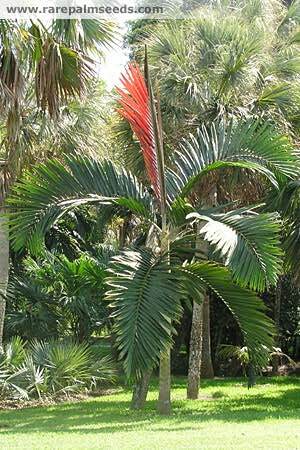 The most common and sought after species is the Cuban Royal, Roystonea regia. 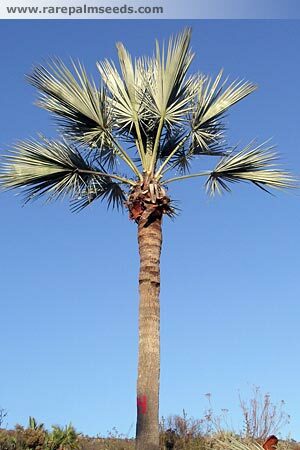 Natives to Florida are chagrined with the fact that "Roystonea elata" was determined not be a unique Royal Palm native to Florida but rather at most a variety of Roystonea regia. 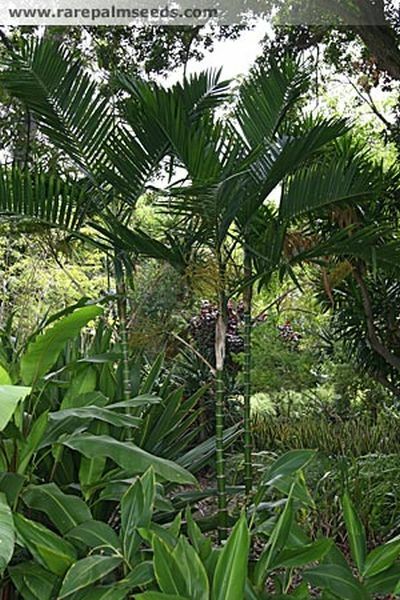 Compared to the South American Royal Palm, Roystonea regia's leaves hang down past (lower than) the midway point of the crown. Roystonea oleracea's leaves stop at the "half moon" point and don't hang down near the trunk. Royal Palms love heat and sun. Cold tolerance is about 25 degrees F. They are fast growers. We have a pretty good supply available of assorted sizes. Note how the base of the well grown Royal Palm is quite swollen and fat. On up the trunk there is variable swelling present. One picture here shows a really massive base on the Royal. The first photo in row three was taken by a customer of ours in San Diego. The plants I'm putting on special today are an easily shipped size of 5 gallon - about four to five feet in the pot. Remember to mention this Blog Special to get this price when you purchase. Shown here are some 5g plants of seeds that were labeled "Phoenix loureiroi variety hanceana". There's always been confusion on naming this particular palm. But, there are two varieties of P. loureiroi. The variety discussed here and shown is Phoenix loureiroi variety loueiroi and this one is synonymous with hanceana. 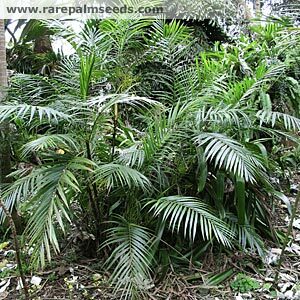 It is a medium height, single trunk, armed pinnate palm from various regions in Asia. Habitat stretches from central Asia down to the Philippines. Mature height is variable but usually under twenty feet. 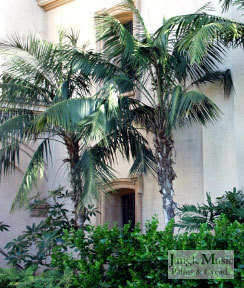 The specimen shown in Balboa Park, San Diego below is 20 years old and ten feet tall. It's a sun species with a cold tolerance to at least the low 20's F.
I am not really a fruit tree grower and don't pretend to be an expert on this subject. 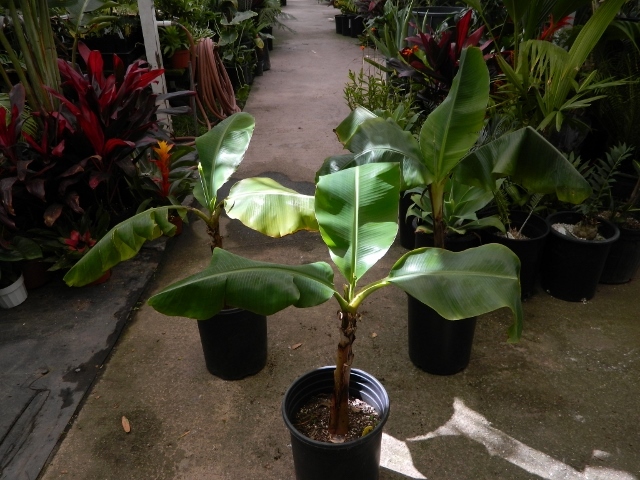 But, I just couldn't pass up the opportunity to offer on sale a very cool fruit producing banana species. These Cavendish Bananas are a dwarf species. They really don't get overhead. And, they easily make ample amounts of small banana fruit. They like sun and have a nice cold hardiness to at least 25 degrees or colder. Most folks in this area have no problem growing them or getting nice bananas. I also have larger sizes. Just mention this special when purchasing to get this price. One of the favorite characteristics of Bismarckia is the blue color to the leaves. But, there is a green variety on the island of Madagascar. At another location, there is an endemic green Bismarckia known as the "Mayotte Island" form. There is very little published about it. It likes sun and is probably cold hardy into the mid-teens F. Most feel it's not quite as cold hardy as the blue form. One photo below by Tim Brian in HI is of a green Bismarckia. The last three pictures were taken in Florida. On these green Bismarckias, often you'll see red in the leaf stem or a hint of it on the leaves.. Of course, this is a full sun palm. This is a very rare palm to find as everyone seeks out the blue type. But, we have this more rare green form and have found they are showing nice cold hardiness to the low 20's F.
You must mention this Blog Only price at time of purchase to get this special price. 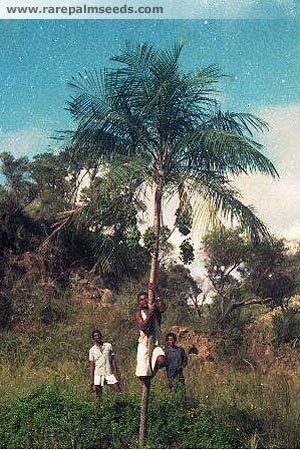 Native to the Mascarene Islands, this thin trunked, crown shafted palm gets to a height of about 25 feet. This variety is called "rubrum" because of the red color that is present on the stems. You'll see this on the photos below. But, often disappears over time. This is a coastal sun or part day sun species with a cold tolerance in the upper twenties F. I've had one in my garden for years in San Diego. Just mention this Blog Special when ordering to get this price. This is a most interesting "variegated" fern from India. Originally I thought this was a tree fern from New Zealand, but that is not the case. This species does not get overhead, clumps and likes filtered light. It wants ample water during the growing season. People who see this plant very much like it. It makes a nice filtered light companion plant. These can be shipped. 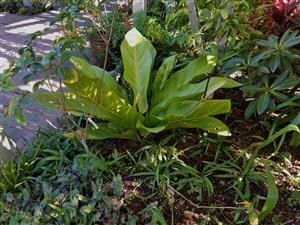 Most people know of the Birds Nest Fern. It does not tolerate much sun and needs adequate water. Letting them go dry is hard on them. We just got in some oversized and nice 1gallon that I'm putting on special. I'm showing a very old plant from our nursery and a photo of this species growing epiphytically in a tree. If you do this, just get them enough moisture. Most know this plant so I won't say much more. Easy to ship. Mention this Blog Special for this price. 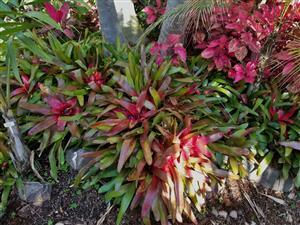 FOR THE GARDEN, INDOORS OR "DANCING"
If you follow our Blog, you know that we excel at offering an assortment of brightly colored "Hawaiian Ti Plants". This includes combinations of pink, red, black and green. But, the pure green plants are difficult to find. We get calls quite frequently for them. I've come to realize there's only two reasons people want them: Cooking and "Hula Dancing". Apparently, by tradition, women doing Hawaiian hula dancing can only use the green form. So, when someone calls for the green form, I automatically assume its for the dancing usage. But, they also make a great garden plant. Typical heights are about five to six feet. Cold tolerance is just below a freeze. They want filtered light. On occasion in he past we've offered larger green plants for sale (see photos below). But, we just got in some nice 6 and 8 inch plants and are putting them on sale. The photos show both sizes. These can be mail ordered. Limited numbers available. 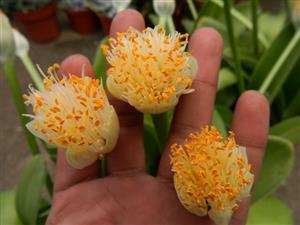 I have only two of these extremely rare hybrids of Syagrus picrophylla. 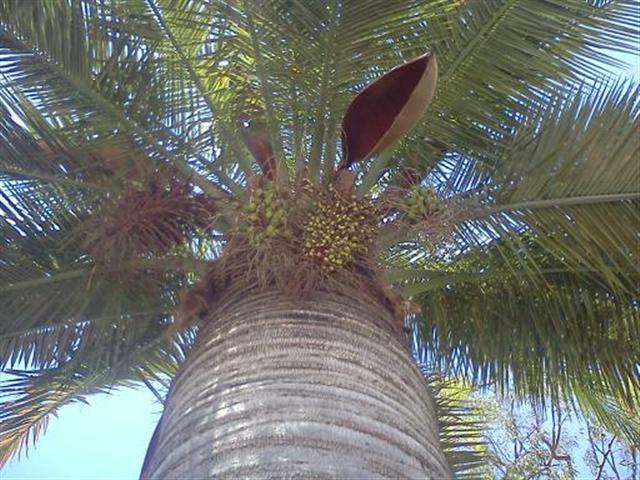 The seeds were produced by the same hybridizer that created the Coconut Queen Palm. I do not know what they are hybridized with and probably can't find out. The hybridizer is in his mid eighties and a bit forgetful. Plants are in 25 gallon containers, have been outdoor grown in sun. They should prove to be a very interesting hybrid palm. They are twelve feet tall and too tall for typical shipping or mail order. The last photo is of the pure Syagrus picrophylla by G.M from PACSOA. I know of no hybrid garden specimens of this species, so I cannot show a mature example. 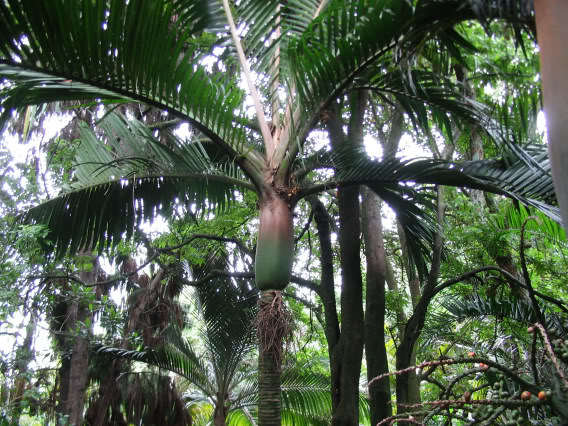 This unusual single trunk palm species is native to the small island of Vanuatu. It is a tall species reaching heights of over fifty feet. It has a silver-green crown shaft and premorse leaflets. It is quite exotic appearing. It is a sun species along the coast. It does tolerate a freeze. But, is a lot easier to grow than other Veitchia species. Customers have told us it’s their favorite of the genus by far. I don’t have many, but I'm offering the fifteen gallon size on special. And, I forgot to say, it’s super rare and near impossible to find. Just mention this blog special at the time of purchase for this price. 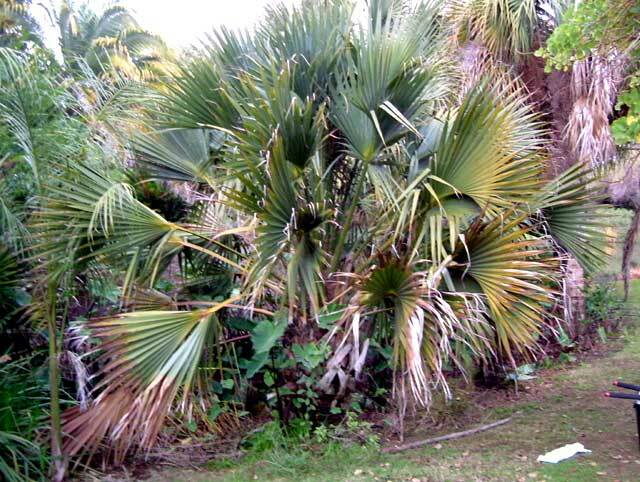 This suckering palm species is native to Mexico and Central America. It is one of about four types of "Bamboo Palms" and is probably either the best or in a stiff competition with Chamaedorea hooperiana. This species gets to a mature height of twelve to sixteen feet, has strong 1 inch to 1.5 inch trunks which are green in color with prominent rings, and about three to four foot long leaves. It is an upright grower and does clump. It doesn't run. It takes filtered light or morning sun along the coast. I've even heard of some growing it in full sun although I'd not recommend it. It is a good growing species. Cold hardiness is into the mid to lower 20's F. Below I'm showing our fifteen gallon size which I'm putting on special. I also showing a mature garden plant. This is a great palm! Remember: Mention this Special for this Blog Only discounted price. These New World epiphytic plants are great fun. 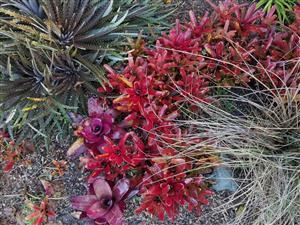 They are one of the many genera of Bromeliads. Native to regions stretching from the Southern US down to South America, these plants attach to tree trunks, branches, posts, fences or anything they can find. Most do not live in the ground. They live off of natural rainfall or humidity and are not harmful to the hosting plant/tree. All will flower. Flower color on these plants is blue. They are just starting to flower now. We have multiple varieties but are putting this variety on sale. Most growers divide plants into single plants and sell them one at a time. The plants on sale are clusters (natural) of ten to fifteen individual plants. And, we’re putting them on sale! They are attached together by their stems, just like in the wild. These are very old clusters. You can put them on a piece of bark, wood or whatever you want. Or, hang them from a fence or mount them to a tree trunk. These are the largest clusters we've ever offered. Remember: Mention this Blog Special for your discount. These are easy to ship, weather permitting. This species of palm is typically single trunk but there are suckering forms. It is native to island of Nossi-Be off the coast of Madagascar. It can reach heights of over thirty feet. It has leaves arranged in three ranks - "tristichous". Trunk diameter is about 8 inches and the crown shaft is a rusty-brown color and not elongated. Although I can’t be positive, I think this will be the single trunk form. This is a difficult species to find nowadays. I'd recommend growing it in full sun along the coast. I'd estimate cold hardiness to be in the mid-twenties F. The 15g size is shown below – and on sale! Remember: Mention this Special for this price when you purchase. In the "old days", this species was known as Opsiandra maya. 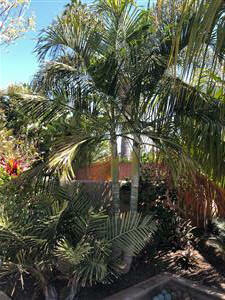 It is a single trunk pinnate palm that can be grown in Southern CA. It has the interesting habit of getting a very swollen base, especially when planted in the ground from a smaller plant. Interestingly enough, this swollen base to the trunk abruptly disappears with age. You'll note this bulge in the photos below. This species tends to hold a limited number of leaves, about five to seven usually. Along the coast it takes full sun. Cold tolerance is into the mid-twenties F. The trunk diameter is about six to perhaps maximum eight inches. I've grown it in part day sun, which it loved. However, the trunk will often curve to seek more sun (see photo bottom row). Some grow it in full sun with success. The plants on special are very nice 15g with fat bases. This size can be mail ordered. But, remember to mention this Blog Only Special for your discount. The second garden photo is by J.V. PACSOA. I'm also showing a large boxed specimen below that's grown through its swollen base. Enthusiasts are always looking for attractive companion plants that don't get too big. 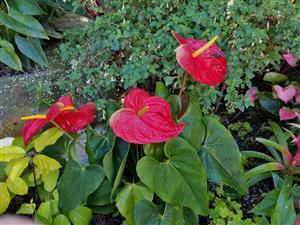 Shown here is what's called the "Birds Nest" Anthurium. 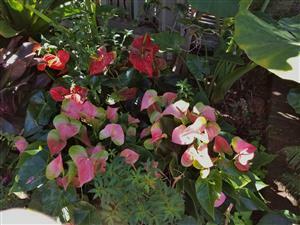 The one on sale is Anthurium hookeri. This species is good for filtered light situations and rarely get over six feet tall. The leaves are long, wide and very thick to the touch. Their leaf surface is wavy. The plants on sale are 5 gallon size, about five to six years old. This size is shown in the first six photos below. 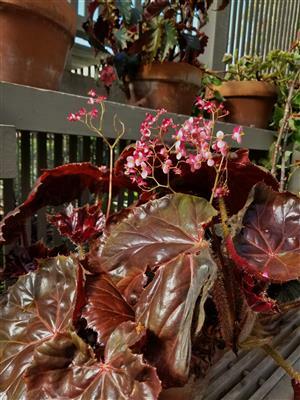 Cold hardiness is into the mid-twenties F. Flowers are red, as are the tiny seeds. These plants are real winners. You just have to keep the snails away from them. The last two photos are of an older 15 gallon at the nursery. Remember, mention this Blog Special when you purchase. This species is native to the Mediterranean coast of Europe and the genus extends down into Morocco where plants become more blue in color and are known as C. cerifera. Regular Med Fans are green to blue-green in color and one of the most cold hardy palms around. They like sun and tolerate temperatures perhaps below 15 degrees F. Color of the leaves and height of the stems is quite variable. There are dwarf and very tall clones found. Leaf stems are armed and the underside of the leaves is often silver. This is a suckering species. Mature heights are variable, anywhere from about eight feet up to fourteen feet or a bit more. We are offering California grow 1 gallon plants on special. They can be mail ordered easily. We’re putting them on a very steep discounted price. Blog only special. You must mention it when purchasing. 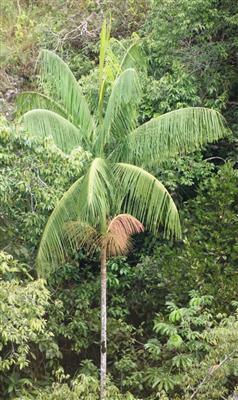 This commonly used and appreciated palm is native to Brazil and gets to a mature height of fifteen to twenty feet. Leaf color varies from green to intensely blue. On sale is the green form. 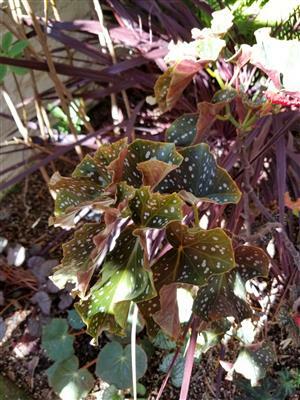 It has a medium thickness trunk and has curved leaves as shown on the garden plant below. Cold hardiness is 16 degrees F. and it loves full hot sun, even in the desert. We’re putting one gallons on a steeply discounted special. These are easy to mail order. Just remember: Mention this Blog Special for your discount. We can easily mail order this size. Previously I've discussed this great companion garden plant for filtered light. We just got in some very nice 1 gallon plants in blossom. For a one gallon, they are very full, sometimes with several plants in the pot. I'm putting them on special. The blossom last for about 3 weeks. They've come into blossom in the last few days and are a spring bloomer. These can be mail ordered but I can't guarantee safe arrival of the flowers. Trachyarpus fortunei is the most commonly available and commonly grown of the Windmill Palms. It is of Chinese origin . It is referred to as the Chinese Windmill Palm, the Windmill Palm, or the Chusan Palm. 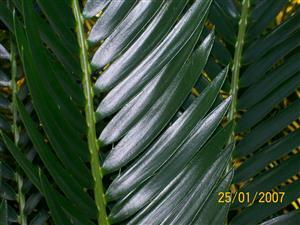 Note how the term "Windmill Palm" can refer to this particular species or to the genus as a whole. It is not uncommon to see it growing in colder areas of the United States, southern Europe, the Mediterranean and southern areas of Australia and Africa. Most specimens one will see are in the height range of ten to twenty feet. However, the oldest of trees may reach forty feet height. The actual trunk diameter is typically six to ten inches. The leaves are typically about three feet in diameter and have variable division of the segments. Leaves are green on the upper side and below, but it is not uncommon for one can see a bit of blue discoloration to the underside of the leaf. Distal leaf segments can flex downward toward the ground. Shown here are the one gallon plants we’re putting on special. Of course, we have other sizes available. Remember to mention this Special when you purchase. Royal Palms love heat and sun. Cold tolerance is about 25 degrees F. They are fast growers. We have a pretty good supply available. I hope you like the photos I'm showing here. Note how the base of the Royal Palm is quite swollen and fat. On up the trunk there is variable swelling present. One picture here shows a really massive base on the Royal. Of note, we always usually have this species for sale and, at times, including large 25g or boxed sizes. 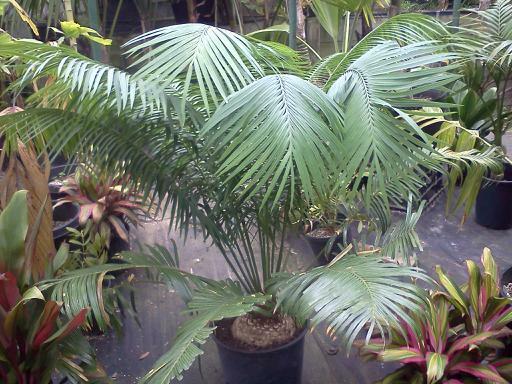 Pritchardia are a tropical fan palm. Most do not get overly large and many are under fifteen feet tall. Along the coast they tolerate full sun. There are about 25 species with habitats ranging from Hawaii to some South Pacific islands. We only grow the Hawaiian varieties as they do the best in Southern California where most will take coastal full sun. Or, grow them in part day sun. Cold tolerance is in the mid-twenties or a bit lower. I'm showing you here a whole assortment of 15g plants. We have about 8 different species in this size. No other nursery in Southern California has Pritchardias this big in 15g size at the prices we're offering. All are easily boxed sized specimens. Some have three to four feet of trunk and are about 14 years old. All are outdoor grown in sun. Leaves on some species are totally flat. Others have a wave to the leaf. Some are colored on the undersides. There's a perfect Hawaiian Palm for anyone. These are way too big and tall for mail order but can be trucked. THESE ARE THE BIGGEST 15G PRITCHARDIA YOU'LL FIND ANYWHERE! Note: Most are a 24 inch box size. All are fabulous. These are too big to ship by Fed Express. COLD HARDY TO UPPER TEENS F.
This suckering Chamaedorea has very thin canes, somewhat wide leaflets, green leaves and an overall small to medium size. Mature plants are rarely over 8 feet tall. Often leaves can have an iridescent sheen and sometimes are glaucous on the back side. This species wants filtered light and is cold hardy into the upper teens F. The 2 gallon on sale are nicely sized and suckering already. They are equivalent to a 5 gallon plant. Remember to mention this Blog Only Special at the time of purchase. These can be mail ordered. 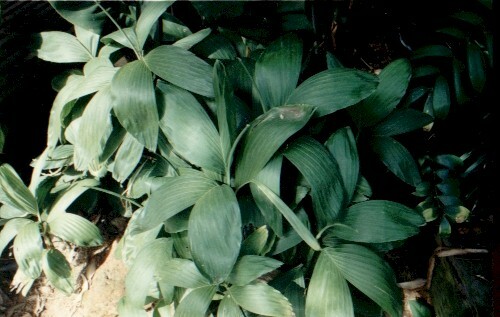 The plants on special are shown in the first two rows of photos. The last row shows a 15g at the nursery. You won't find this species available at many places in the country. It's native to southern Thailand and surrounding areas including Indonesia. It's a large palm. In habitat it gets to a height of thirty to fifty feet with one foot thick trunks. It can have huge leaves over fifteen feet long. In other words, one leaf is taller than a whole clump of Arenga engleri. Like all Arenga, the back sides of the leaves are silver. I'd recommend part day sun or filtered light. Cold tolerance is uncertain, perhaps into the mid-twenties F.
At time of purchase, you must mention this Blog Special to get this price. 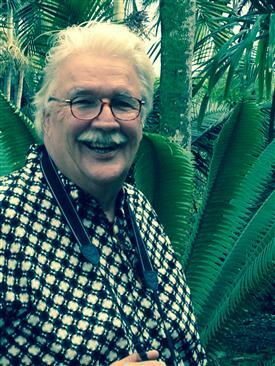 The photo of a mature plant is by R. Kyburz. This is an endangered species from eastern Madagascar. There are perhaps just fifty trees remaining in the wild. It gets to a height of ten to fifteen feet. It has no crown shaft. Leaves are green and arch gently downwards. Leaflets are narrow and trunk diameter is about six inches or a bit more. The fifteen gallon plants I'm putting on sale are eight to ten years old and very nice. We only have a few. It likes full sun and is being well grown by serious collectors in our area. I'd estimate cold hardiness to be in the mid-twenties F.
COMMENT ON AVAILABILITY: Ravenea are a dioecious type of palm. It takes a male and female to set seeds. No more seeds are coming in from Madagascar. And, in domestic gardens, rarely does anyone manually pollinate flowers. So, the days of rare Ravenea are numbered. Get them while you still can! Remember: Mention this Blog Only Special at the time of purchase to get your discount. UNUSUAL AND HARD TO FIND. On special today is one of the highly coveted variegated Rhapis excelsa. Known as the "Gems of the Orient", these striking plants typically have yellow or white variegation on green leaves. Most plants at mature size are three to six feet. There are many exotic varieties - most popular in Japan where affluent collectors compete to obtain the most striking plants. Propagation is by divisions only. As these plants come only from divisions, availability is always limited. Shown below is a flowering 7 gallon plant that shows nice variegation on the leaflets. These plants are not hard to grow. But, they are super slow growing. The plant on special was from a private collection and is over fifteen years old. They like filtered light and are cold hardy to about 20 degrees F. or colder. I do have some smaller, more affordable smaller divisions available. But, these are never inexpensive plants. Note, typically variegation shows better with age. And, only give them minimal fertilizer as too much can drown out the variegation. Mention this Blog Only Special for this price when you purchase. You don't see this species offered that often. It is native to the Pacific coastal mountains from Central Mexico down to Guatemala. It has circular leaves that tend to be flat and a very glossy green on the upper side. The underside of the leaves can be a bit silver. Trunk diameter is a pleasant 12 inches and specimens can reach 30 feet of height after many decades. Regarding culture, it is not quite as cold hardy as other Brahea species like armata, clara and decumbens. I'd suspect it may go into the upper teens F. It is more tolerant of moisture and can be grown in filtered light if there's good drainage. In the latter conditions the leaves are large, flat and shiny. They sort of look like a Licuala leaf. We just got in a limited number of nice 1g plants. They are easy to ship. These are shown in the first two rows of photos. A 15g at the nursery is the last picture below. 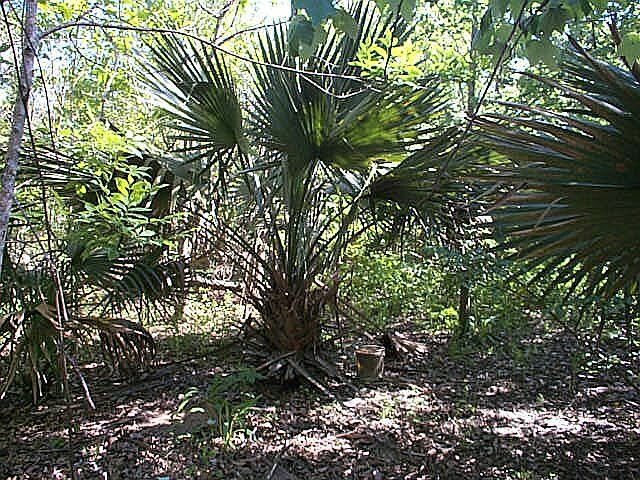 This interesting palm, known as the Dwarf Chusan Palm, does not have a well known natural habitat. Some think it may have originated with a dwarf cultivar of T. fortunei. It is very slow growing with a hairy trunk. Leaves mature are about two feet across, stiff and flat and do not flex down at the ends. A decades old plant may have a trunk under ten feet tall. It wants full sun and may be equally as cold hardy (down to 15 degree F. or colder) as the common Windmill Palm. The plants we have presently are very cute and have very small leaves. There are two plants in the 5g shown here. This particular clone seems to have smaller leaves than plants of this species we usually grow. Remember to mention this Special for your discount when you purchase. The seedlings on sale are from local domestic seed and are about 1.5 years old with two to three leaves. 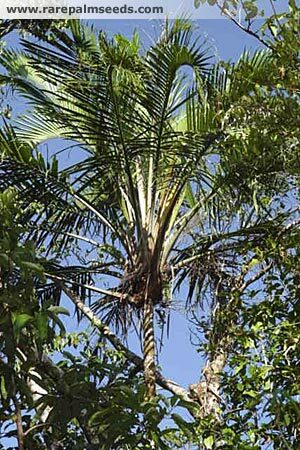 As most know, this a very slow growing species that will, over many decades, give the fattest trunked palm in the world. Ultimate height can reach at least forty feet and trunk diameter up to four feet. The leaf stems are unarmed. Cold hardiness in into the mid teens F. It's a sun species, even in the desert. But, mention this Special to get your discount. Mail order is a piece of cake. We ship plants with soil in their pots. This species is a suckering palm from Madagascar but can also be found as a single trunk specimen. 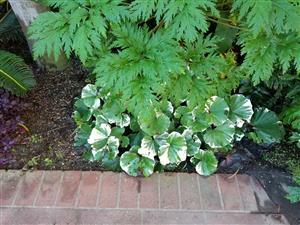 It has either flat or droopy leaves/leaflets and white to silver crown shafts. Overall height is about twenty feet and trunk thickness is four to six inches. It likes coastal part day sun, perhaps more, and is cold tolerant to the mid-twenties F. The plants on sale are the 1g size. Note that they are already suckering. Age about 4 years. The sixth photo is a 5g and next a 7 gallon plant. You must mention this Blog only special when purchasing. This species is native to Brazil and is a single trunk fan palm with a not too large crown of leaves that are green in color. Sometimes they'll be blue-green. This species will retail old leaf bases for a while and give a "knobby trunk" over time. The last photo shows a close up of a trunk with attached leaf bases. Overall height can get over fifty feet although often shorter. Old leaf bases can be adherent to the trunk making rough as shown in the last photo. Economically, the leaves of this species produce a wax that makes carnauba wax. The latter is marketed for various usages including car and shoe wax. 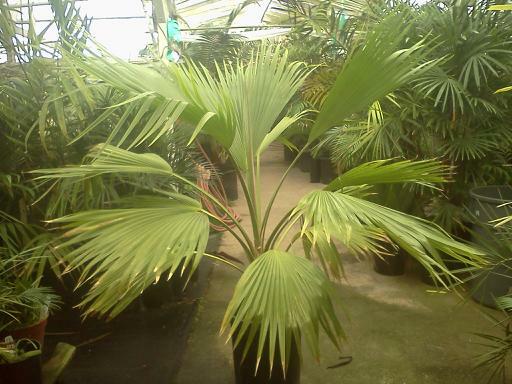 This palm wants heat and sun and is cold hardy to at least the lower 20's F. We are offering our 5g plants on sale. 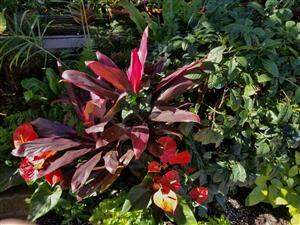 These are photos of some plants outside and in one of our front areas of the nursery. 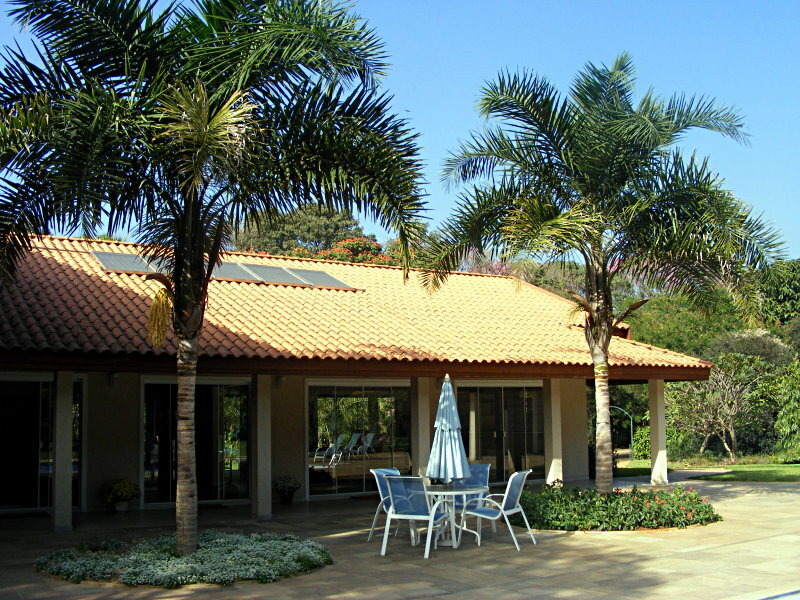 Shown are rare palm trees, interesting cycads and lots of tropical material. All are ready for garden planting. I hope you enjoy this presentation. NEW OFFERINGS EVER FEW WEEKS. The photos show it all. We try to vary our arrivals of new Bromeliads ever two weeks or so. And, they leave quickly. If you like color in the garden, drop in and see what we have! These can be mail ordered. 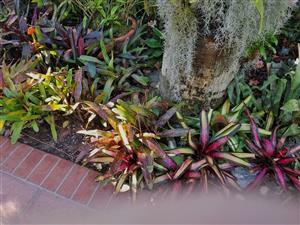 We do have larger and sometimes smaller Bromeliads. OFFERING OF FOUR THIRTY YEAR OLD PLANTS!